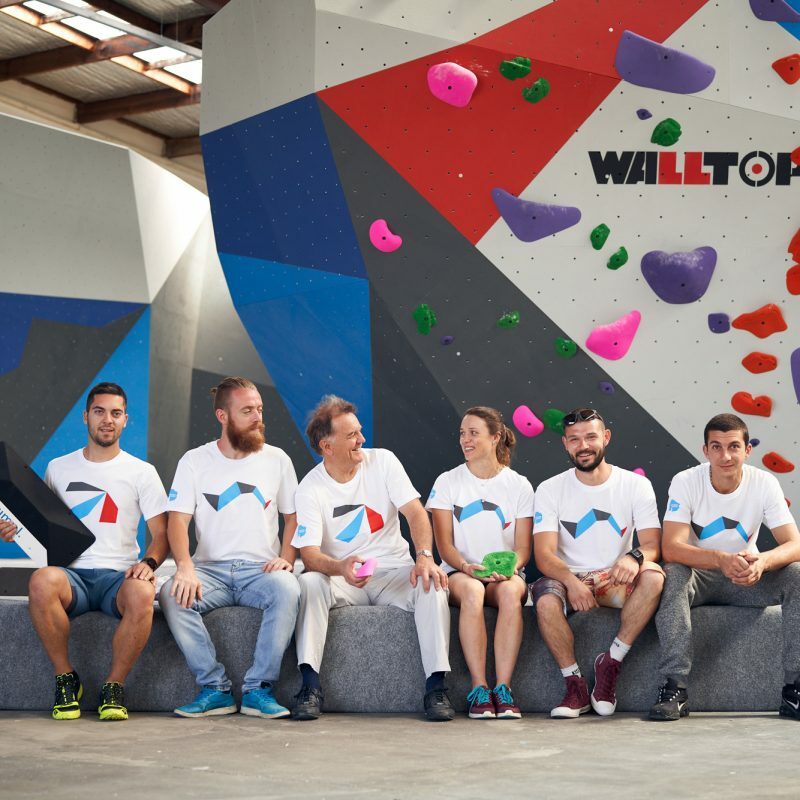 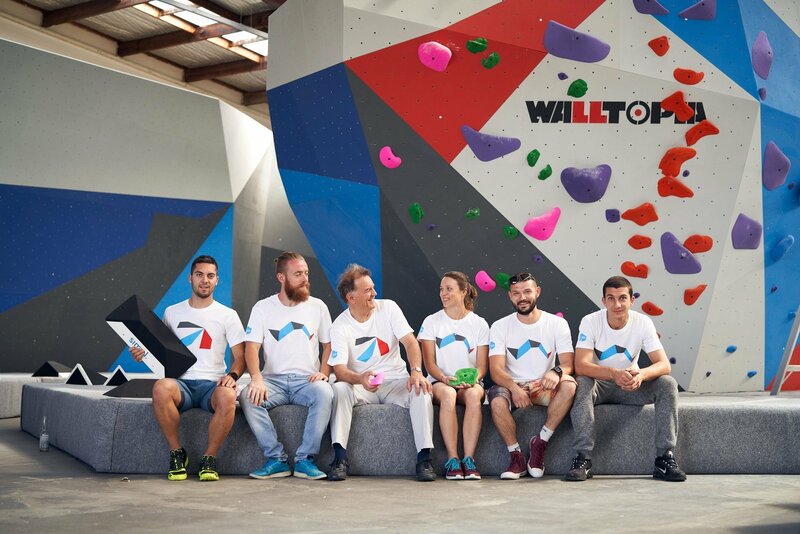 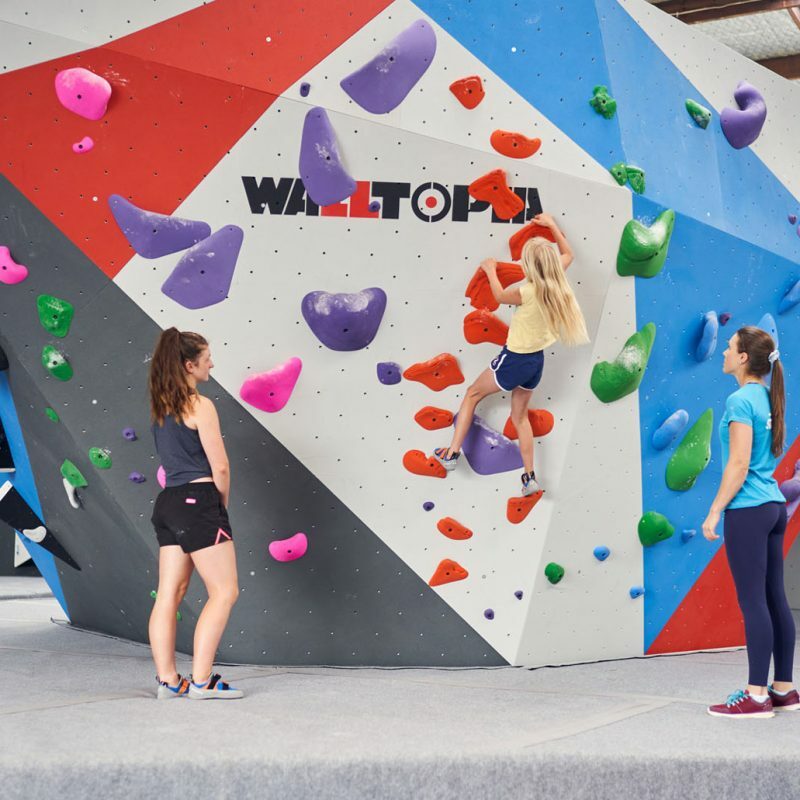 We are proud to offer climbing walls built by world leading manufacturers Walltopia, who have built over 1800 projects world wide. 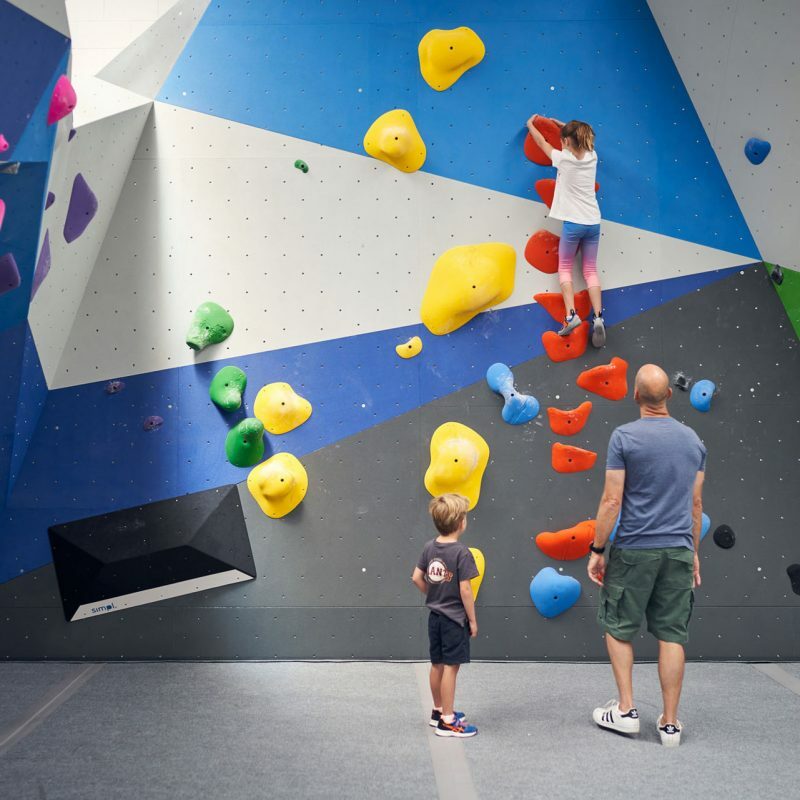 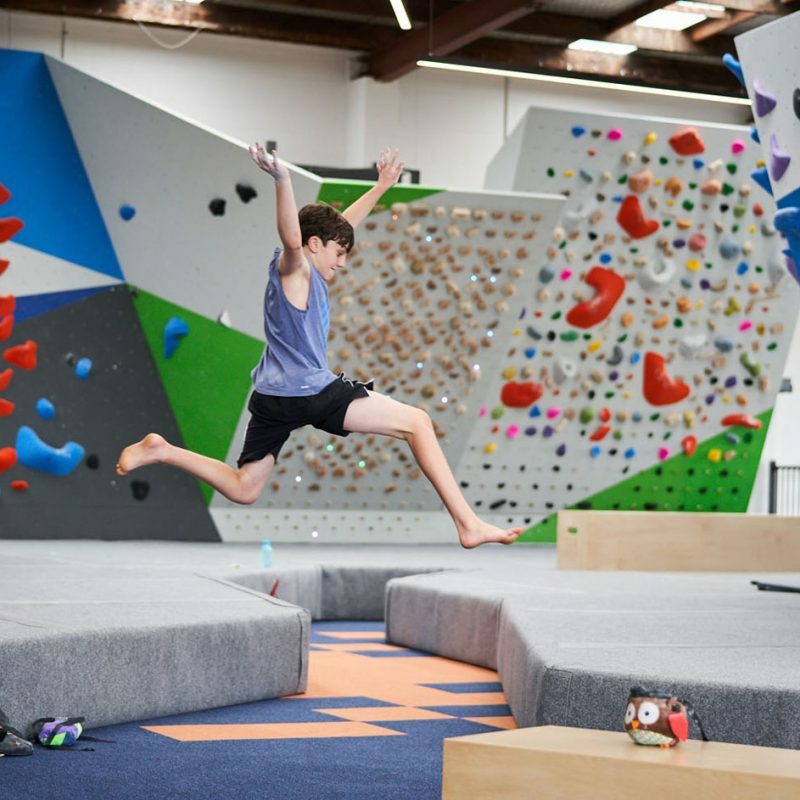 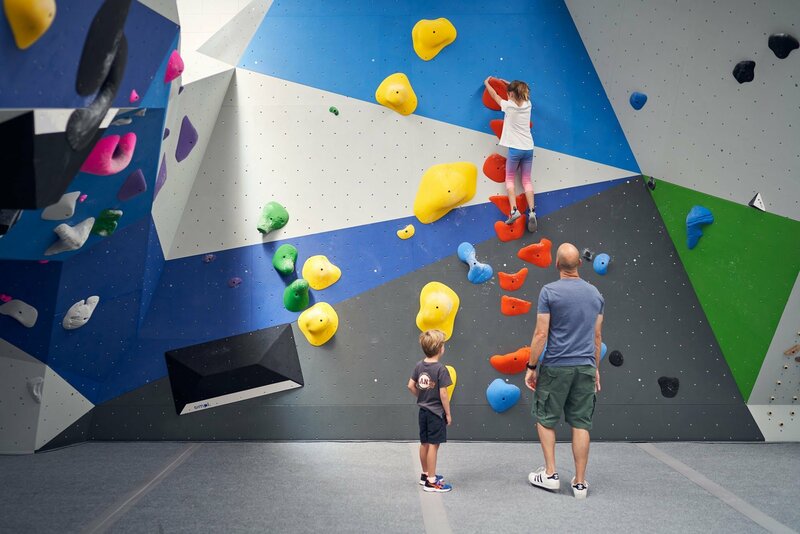 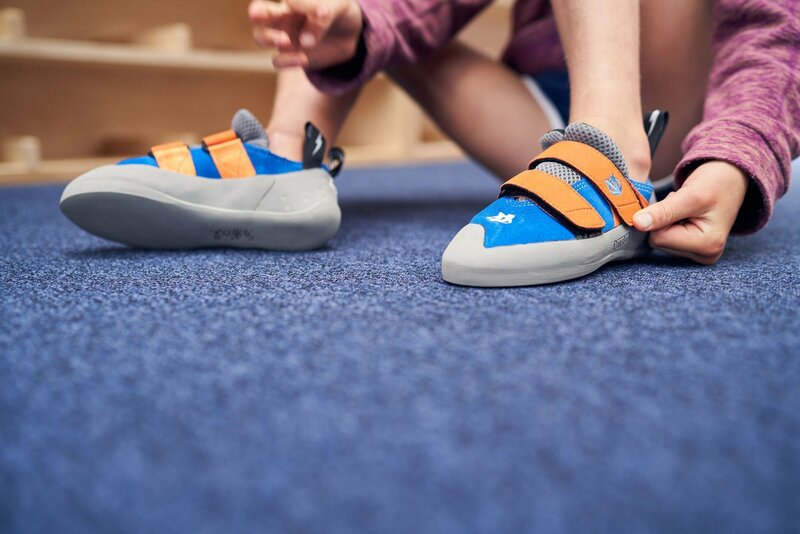 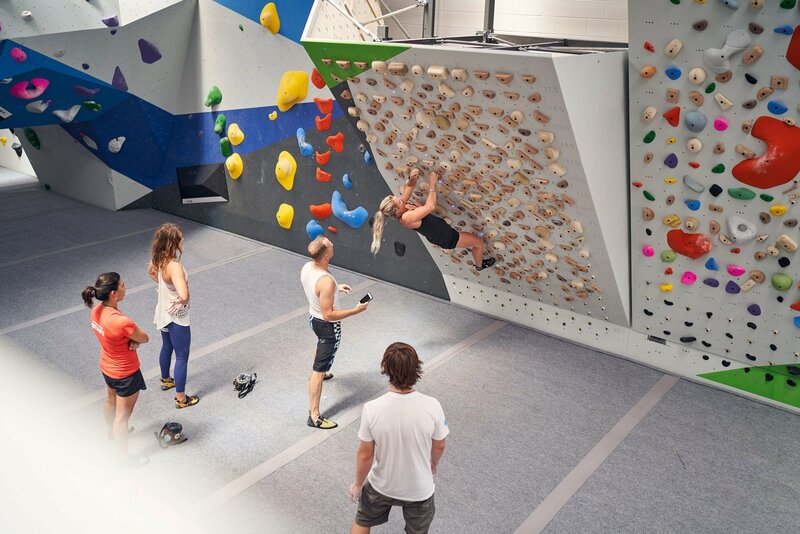 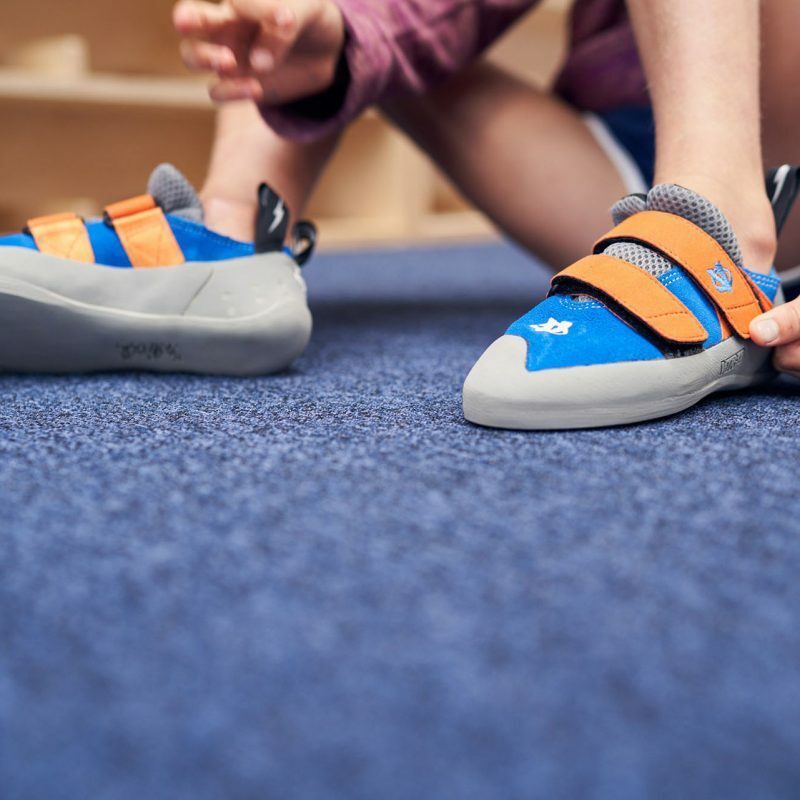 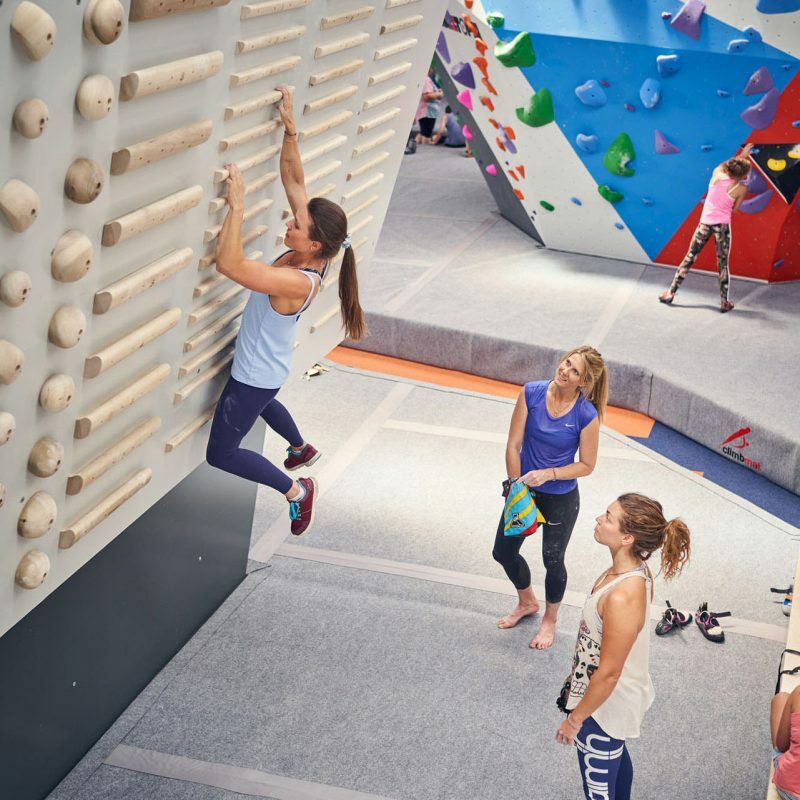 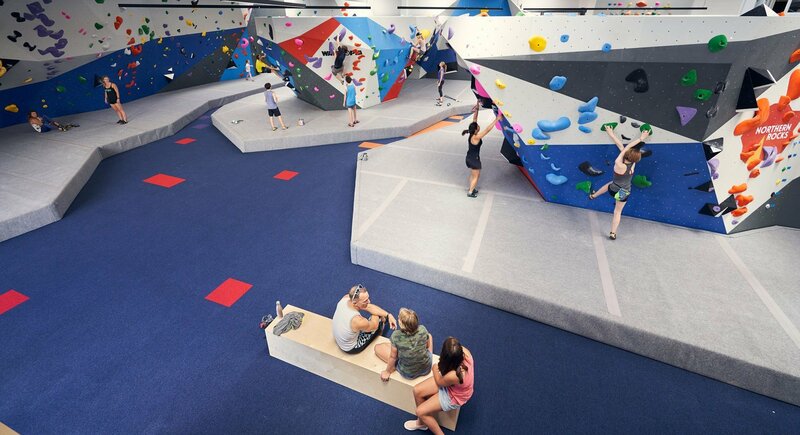 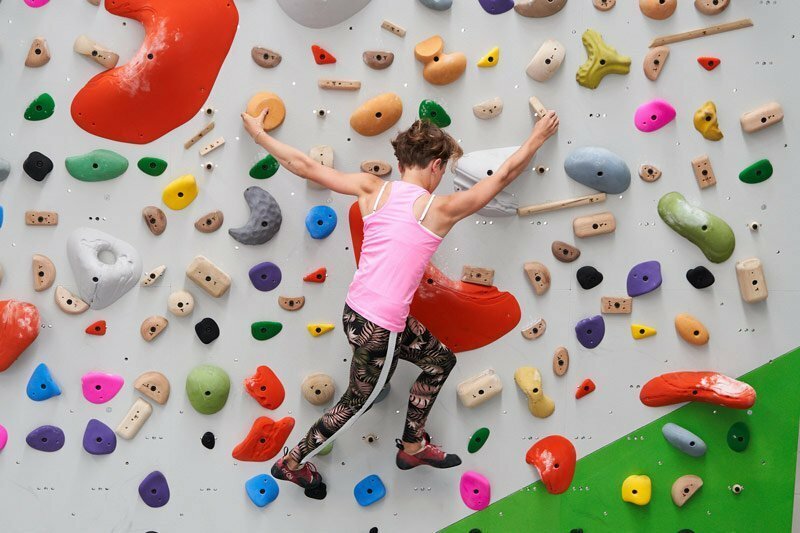 The boulder walls are made from Geome3x plywood made of hardwood birch plywood (40% stronger than softwood plywood), are painted with our unique brand colours and are surrounded by full cover, industry standard 400mm thick crash pads with seam sealed joins and carpet top, ensuring safe climbing for all! 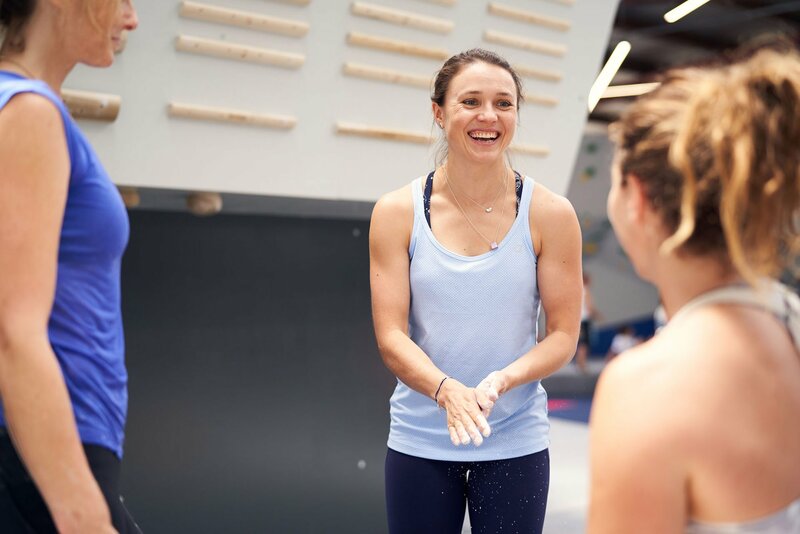 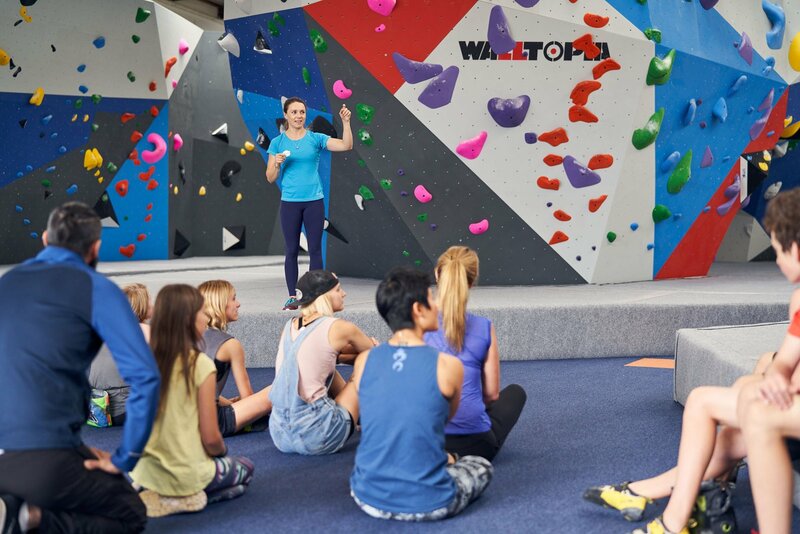 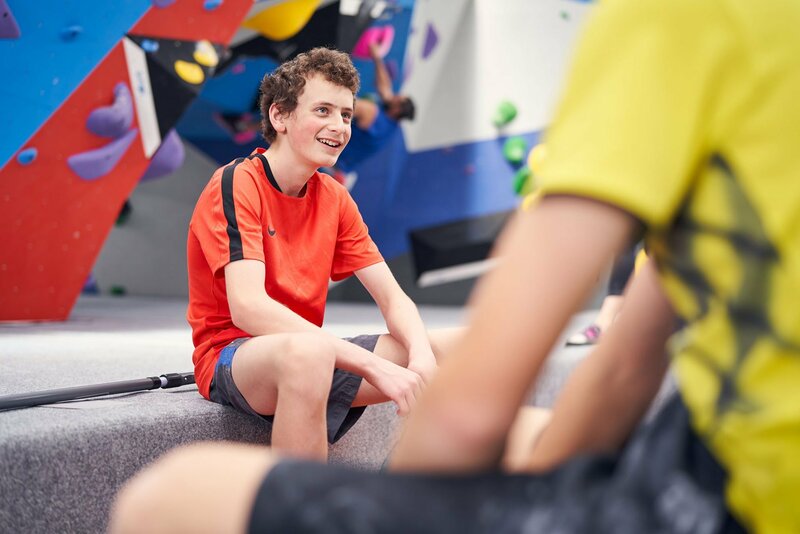 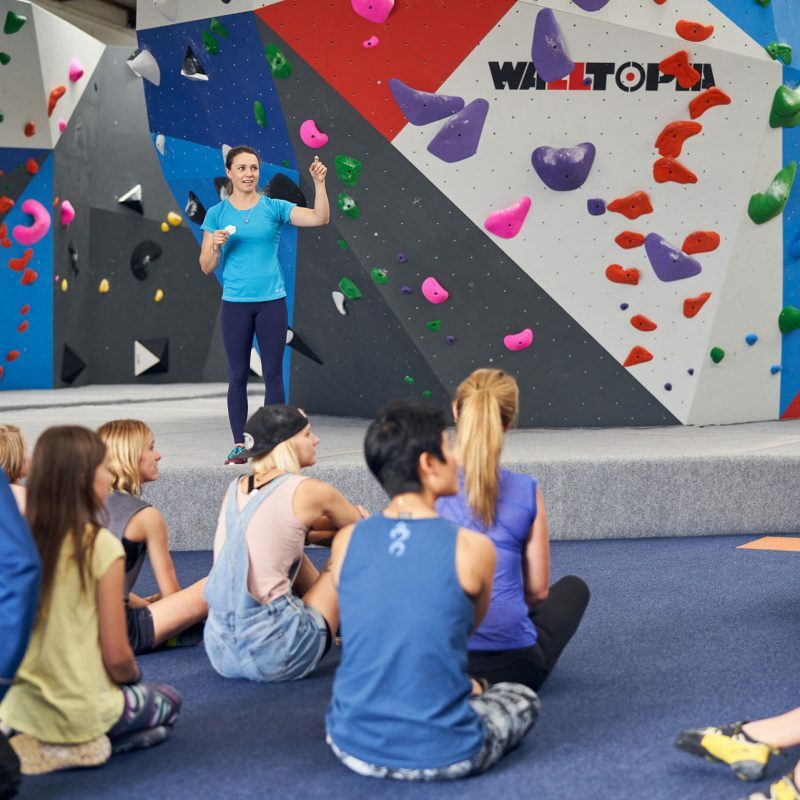 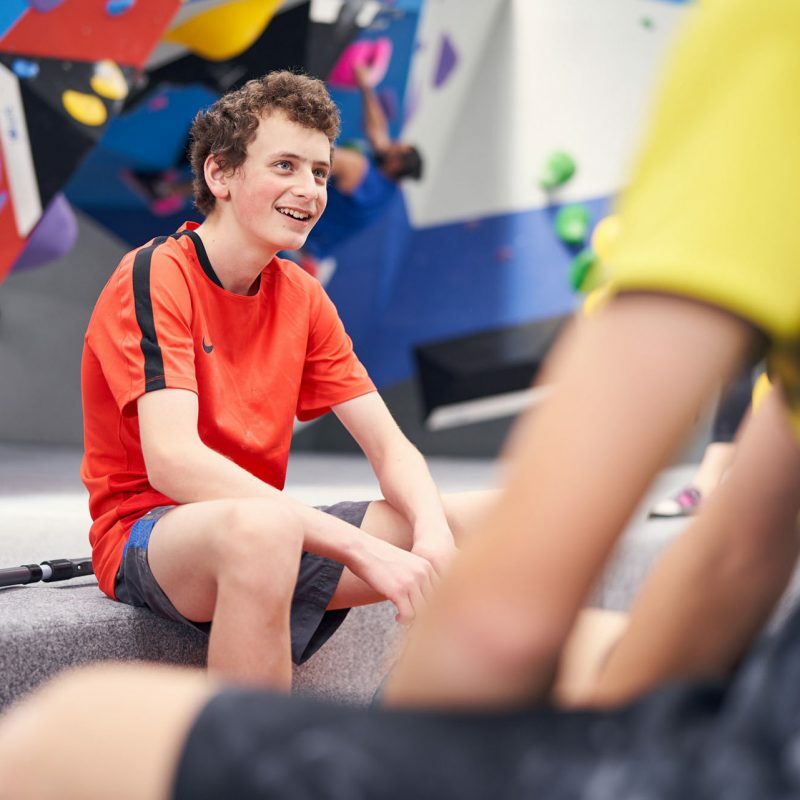 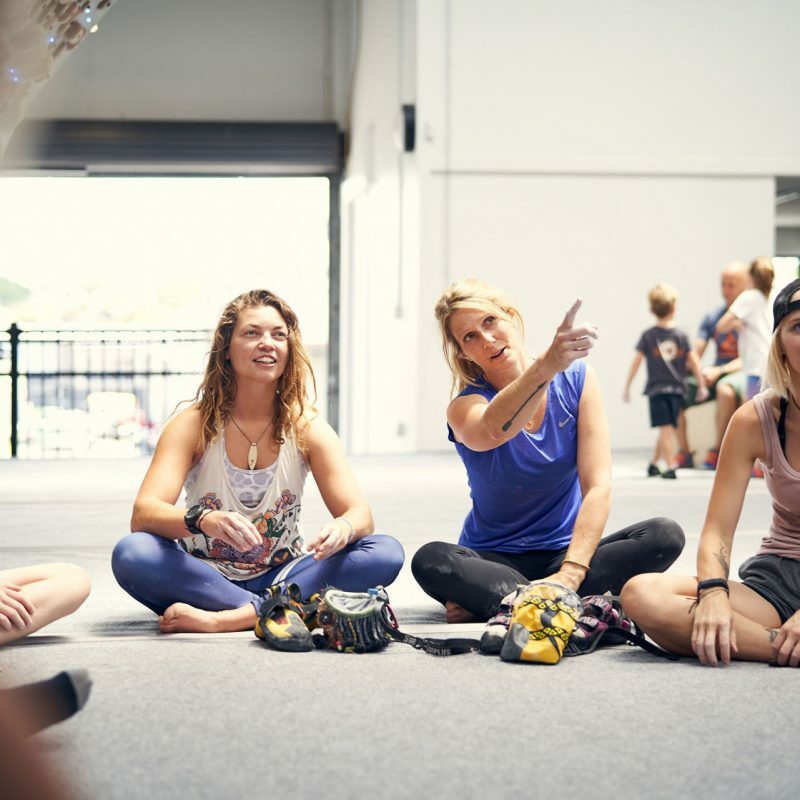 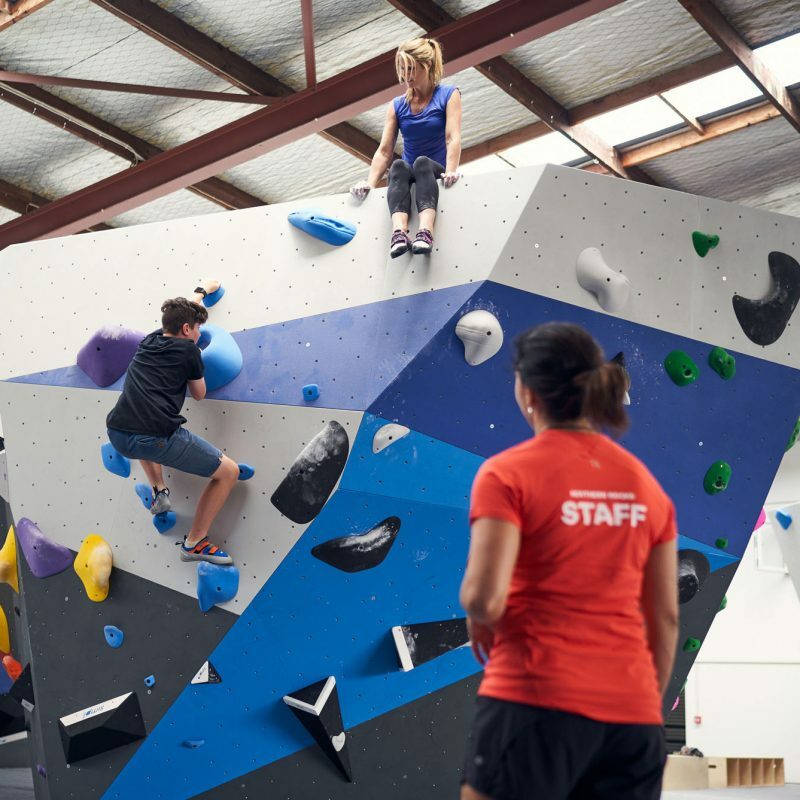 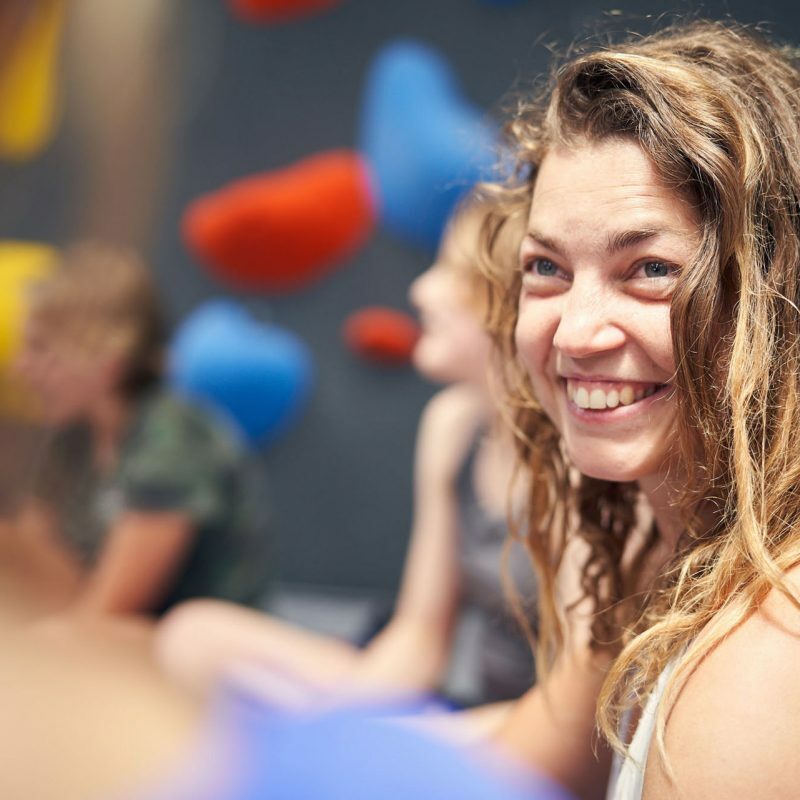 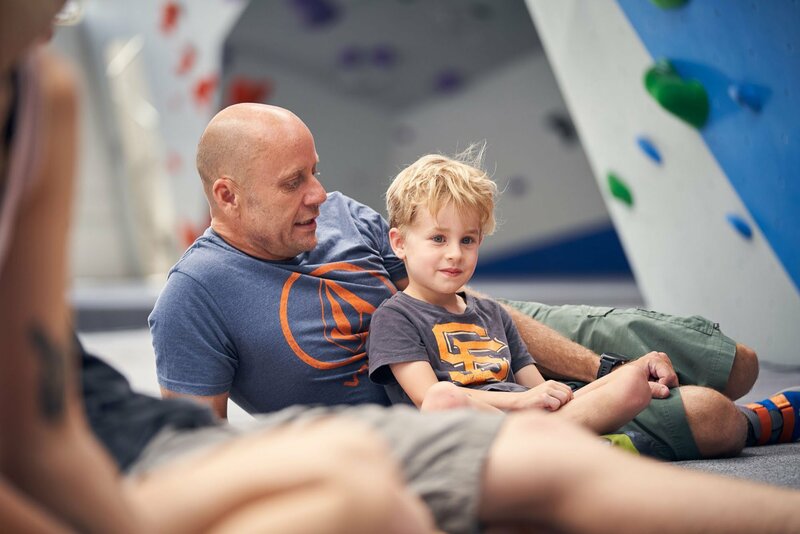 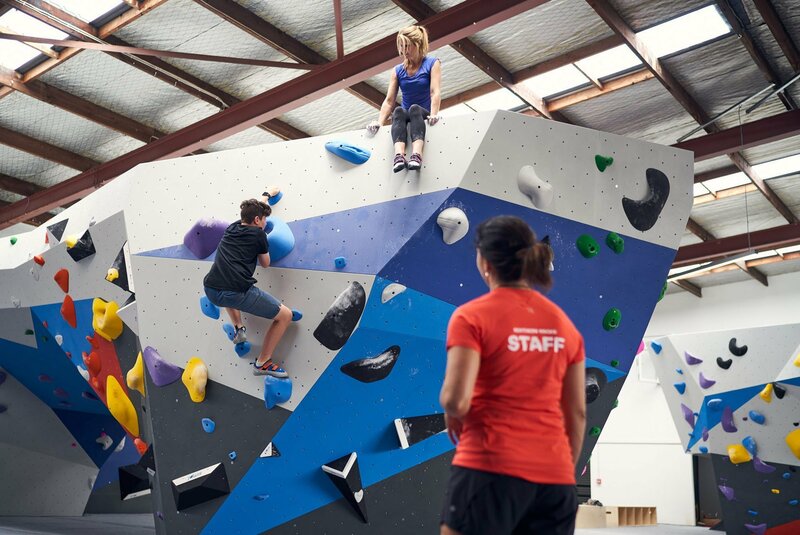 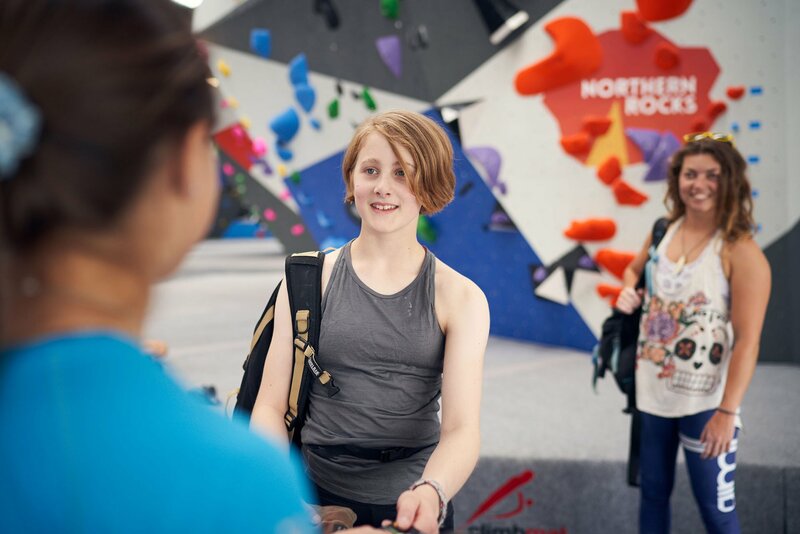 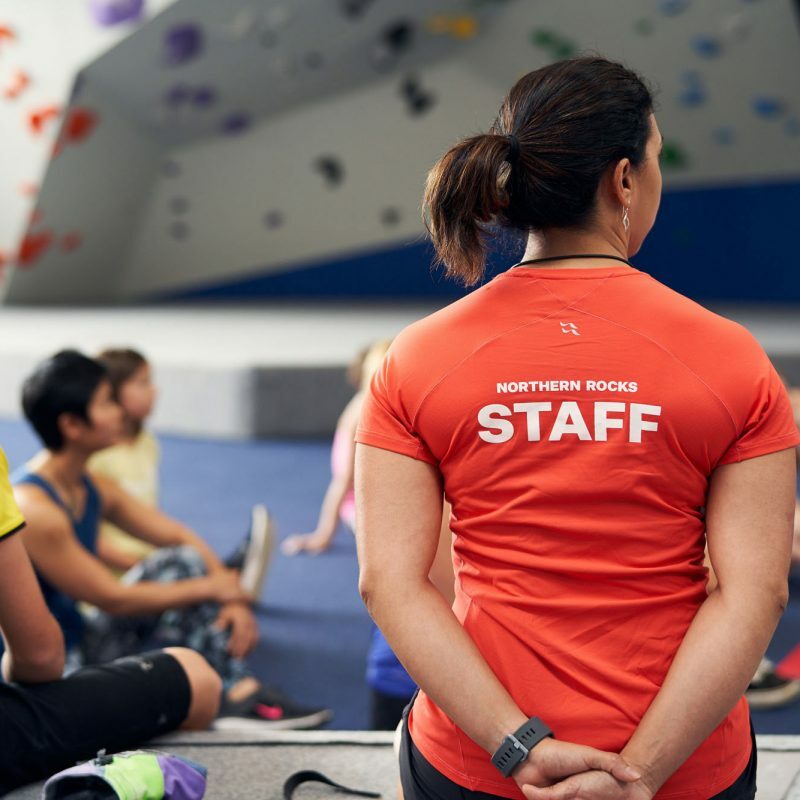 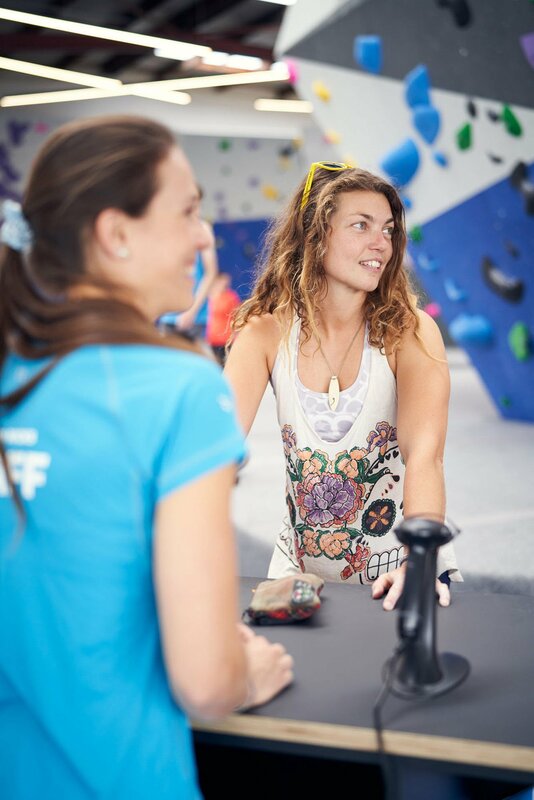 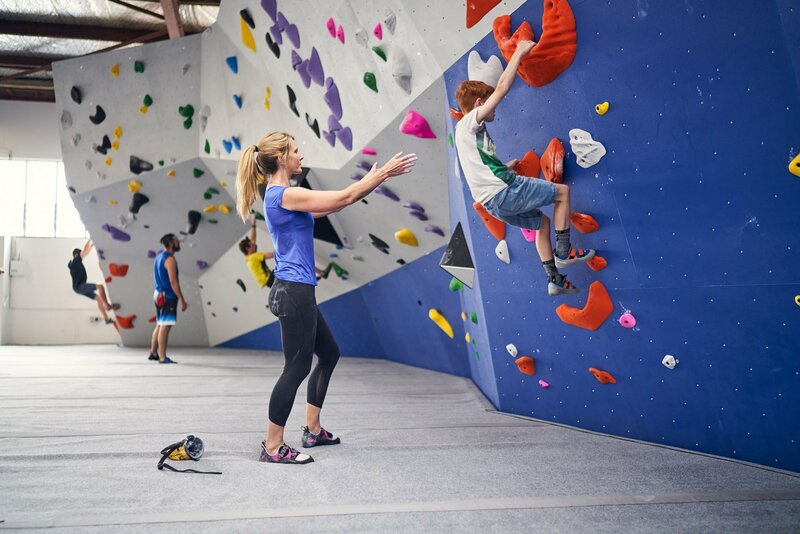 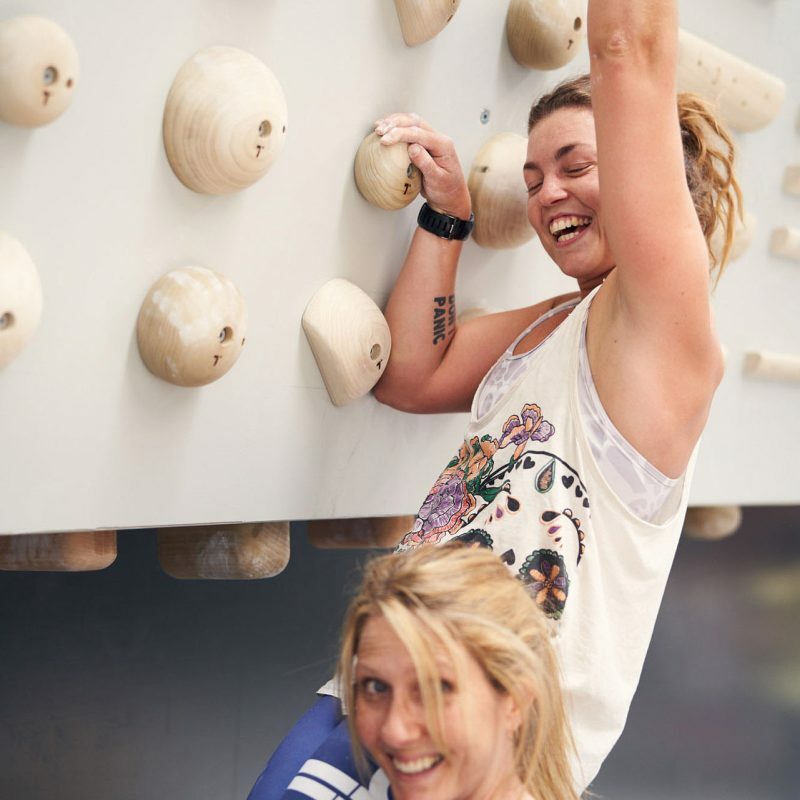 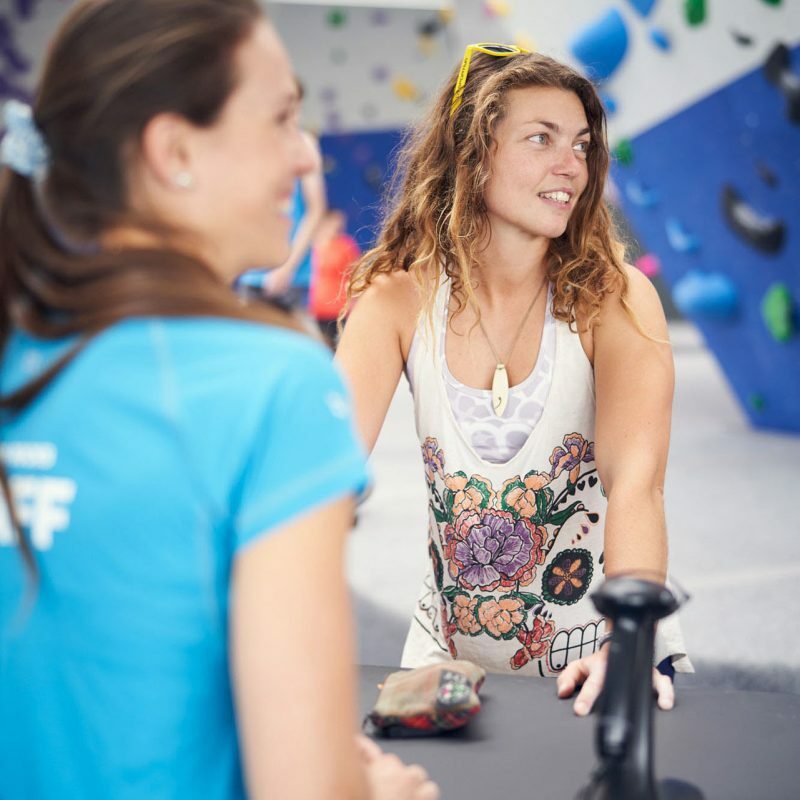 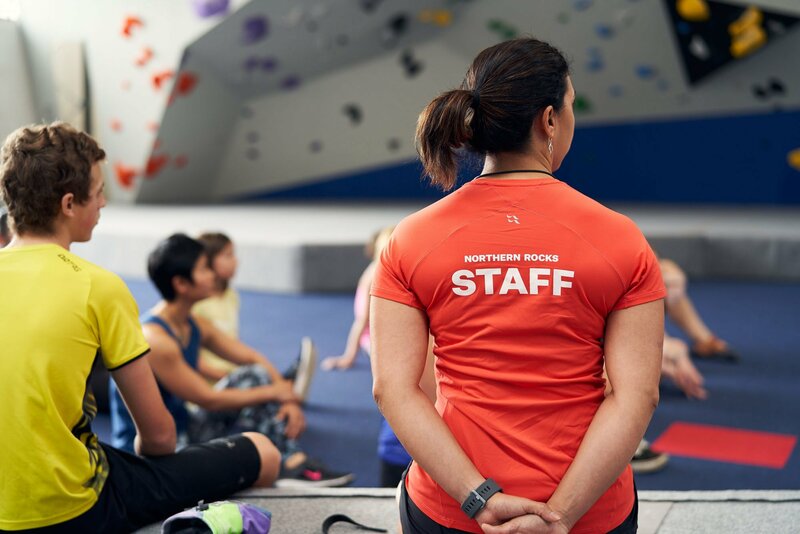 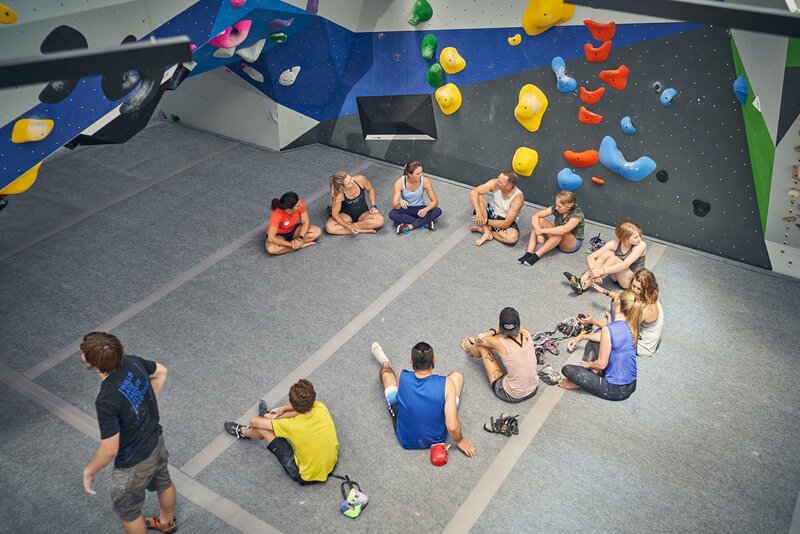 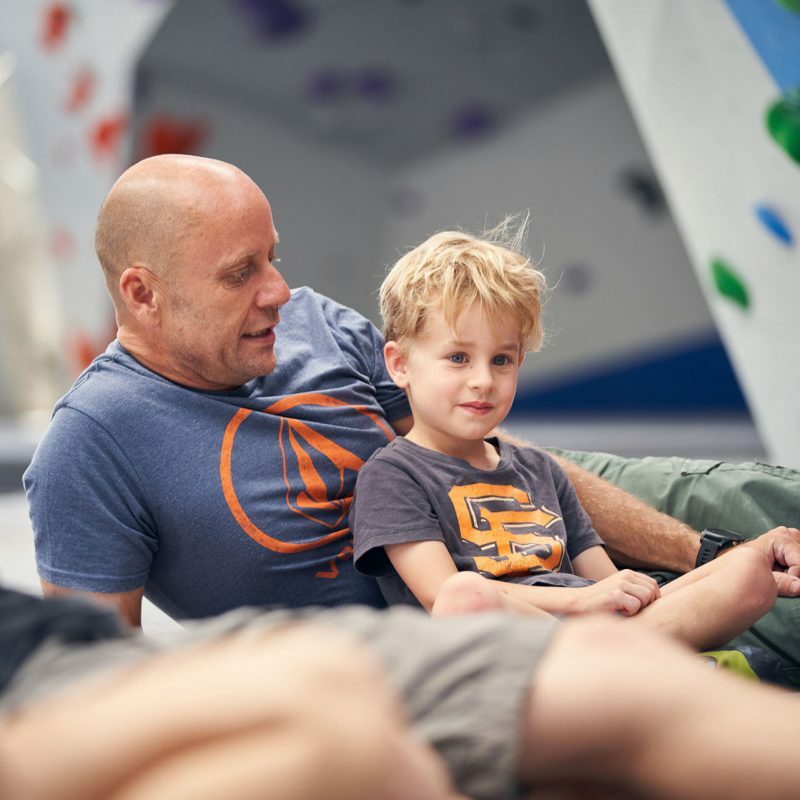 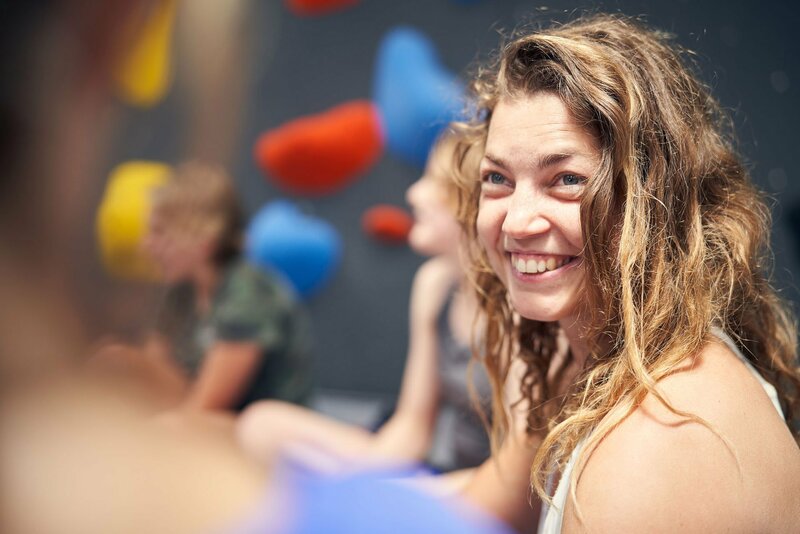 Take your climbing to the next level with one of our bouldering classes and experienced coaches. 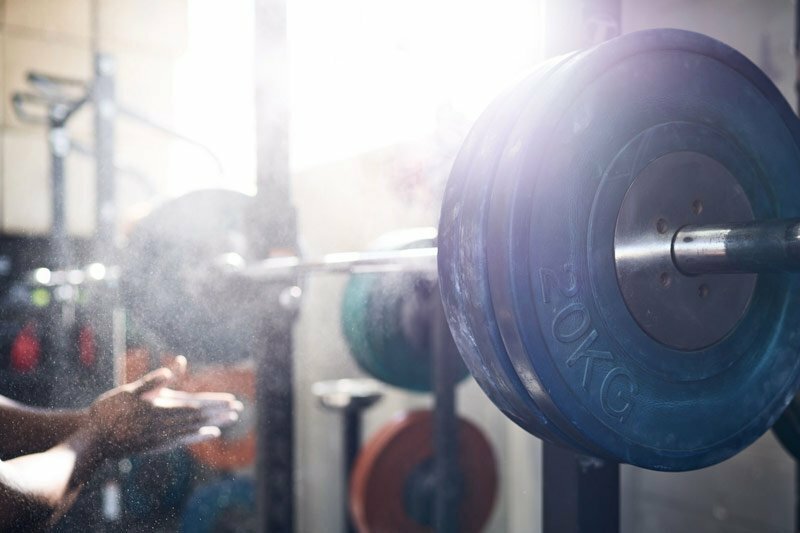 Learn the basics or push your limits, it’s up to you! 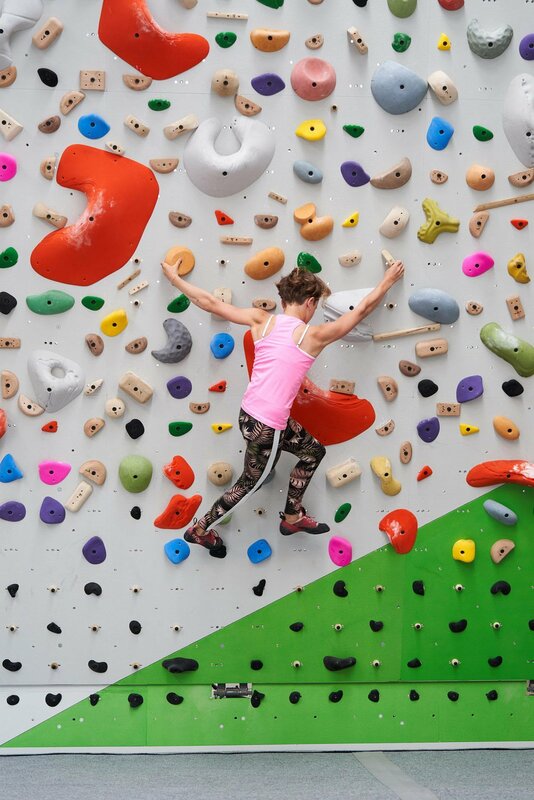 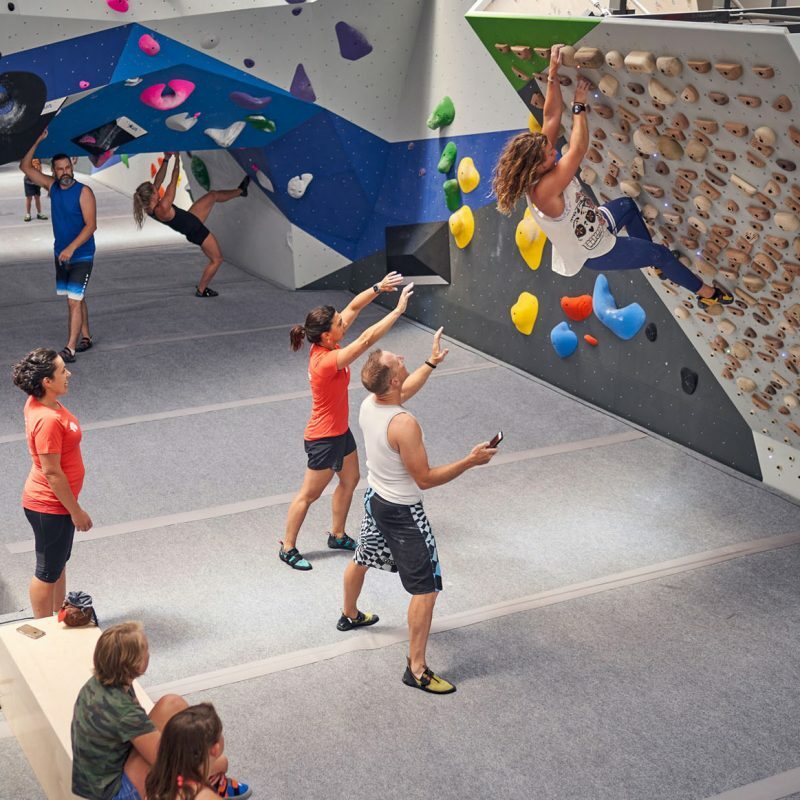 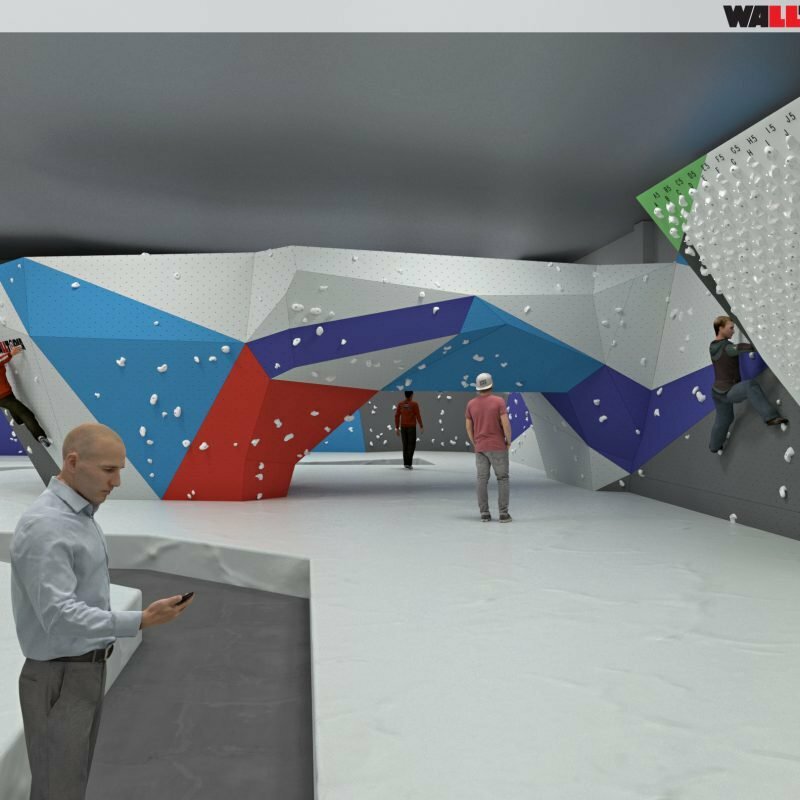 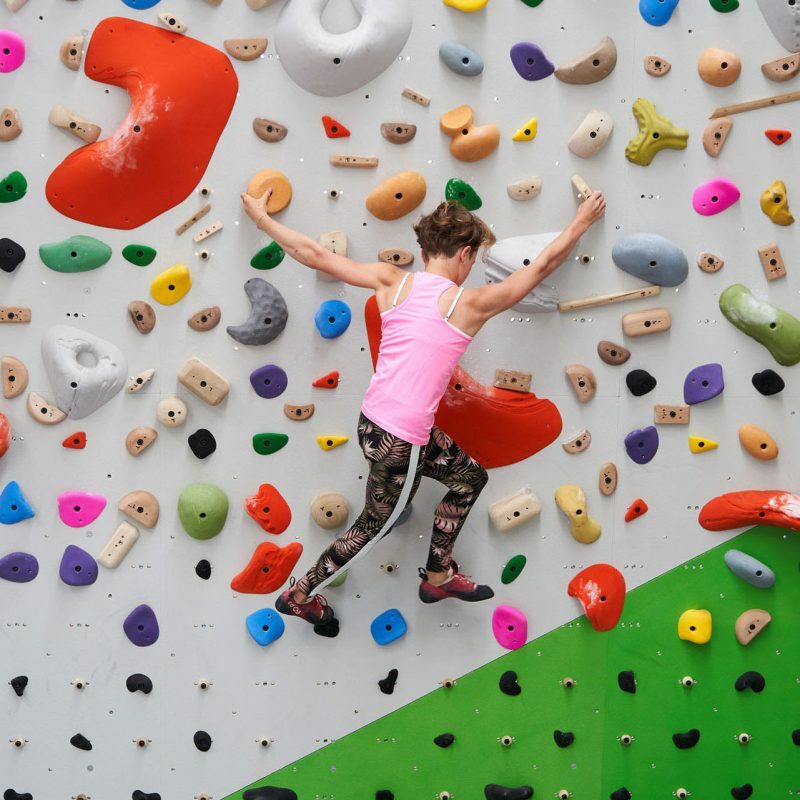 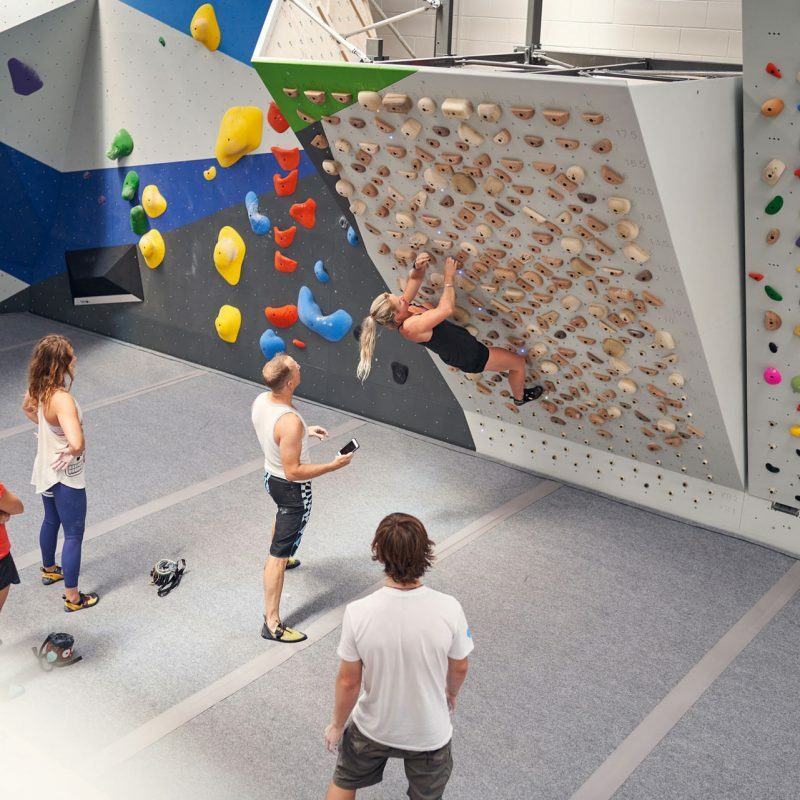 Hydraulic climbing wall vertical to 50 degree overhang, tension board with LED lit boulder problems, campus board, calisthenics bars, rings and free weights. 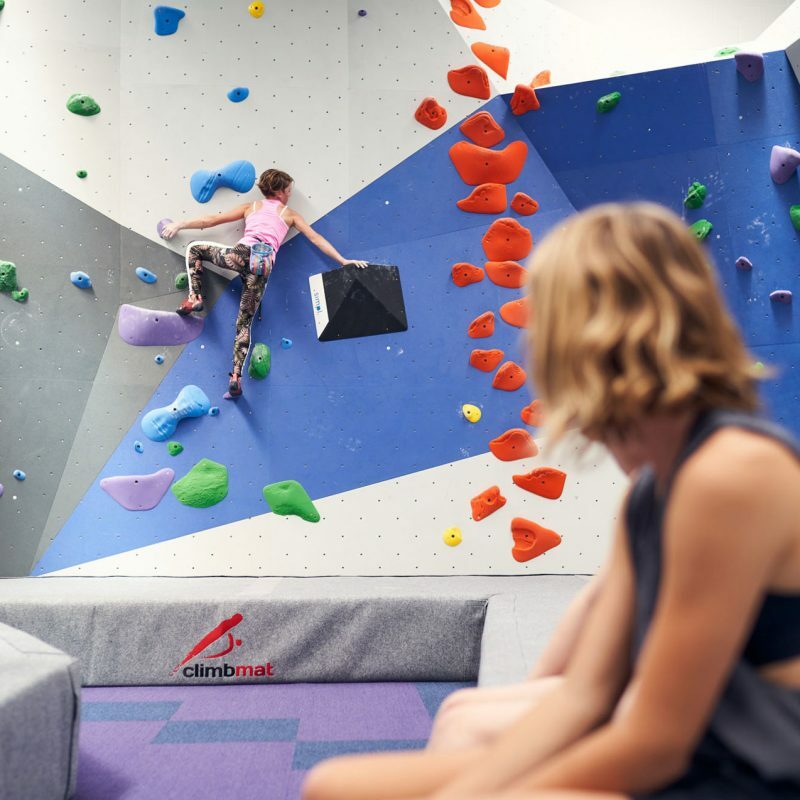 Viewing mezzanine overlooking the main floor, an ideal space for catching up on work or social media with a multitude of charging stations and USB ports. 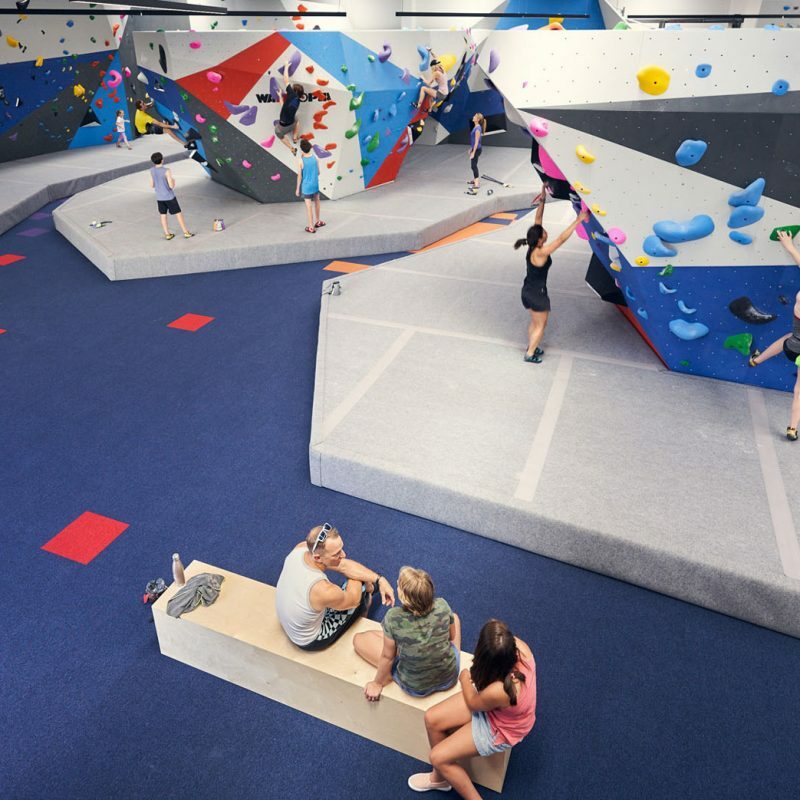 Two 3.5m top out boulders, 4.5m high wall, easy to hard climbing terrain, big roof, slab & vert, arch, variety of angles, high tech crash pads, campus boards and awesome boulder problems. 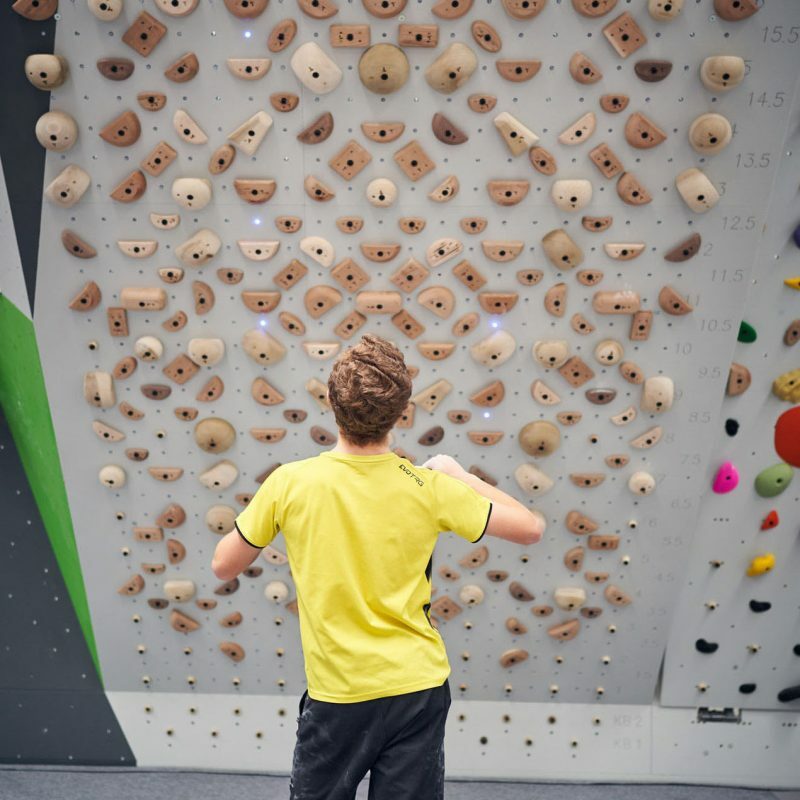 Hydraulic circuit board to 50 degree overhang, tension board with LED lit boulder problems, campus board, peg board, calisthenics bars, rings and free weights. 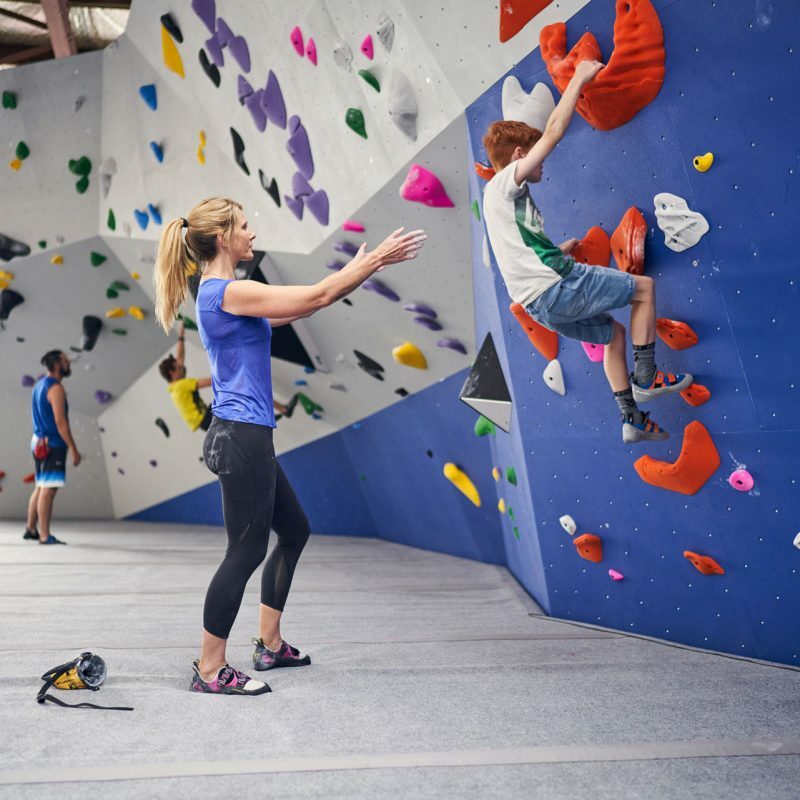 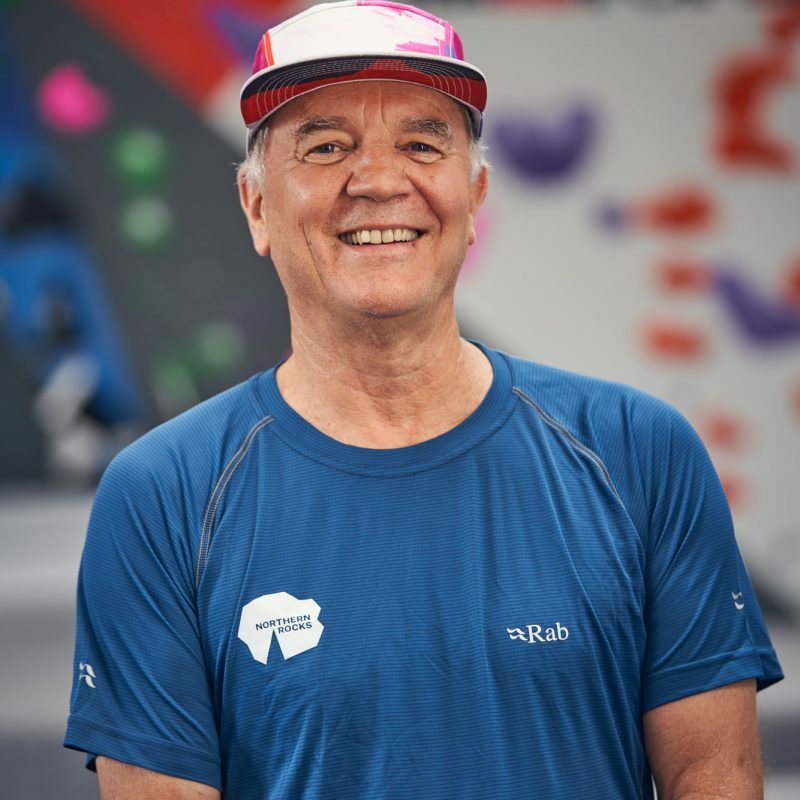 Extensive pro shop offering iconic brand EVOLV climbing and approach shoes, clothing specialists RAB Equipment, finger tape, chalk and brushes and hang boards. 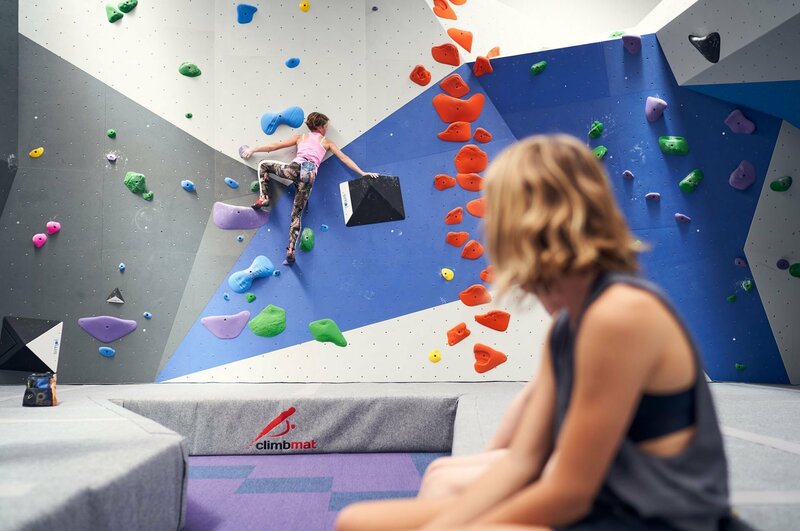 Towel off after your session in our newly refurbished bathrooms, hire a towel for $3 from reception. 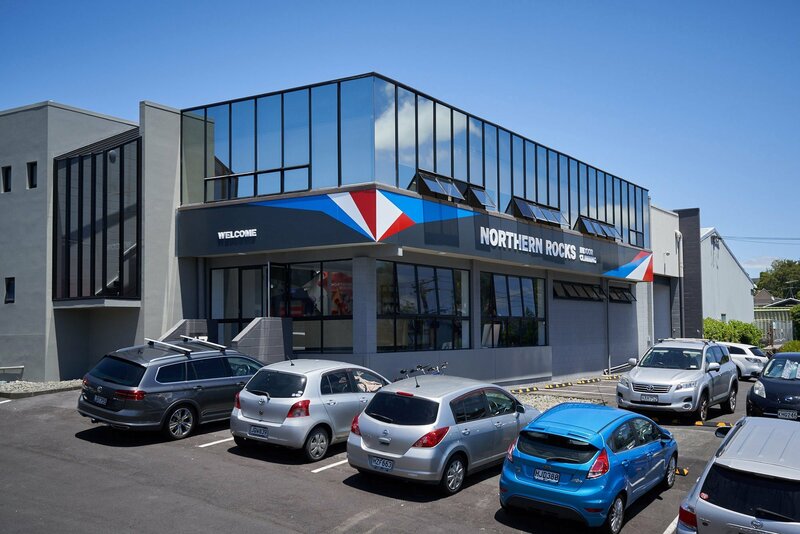 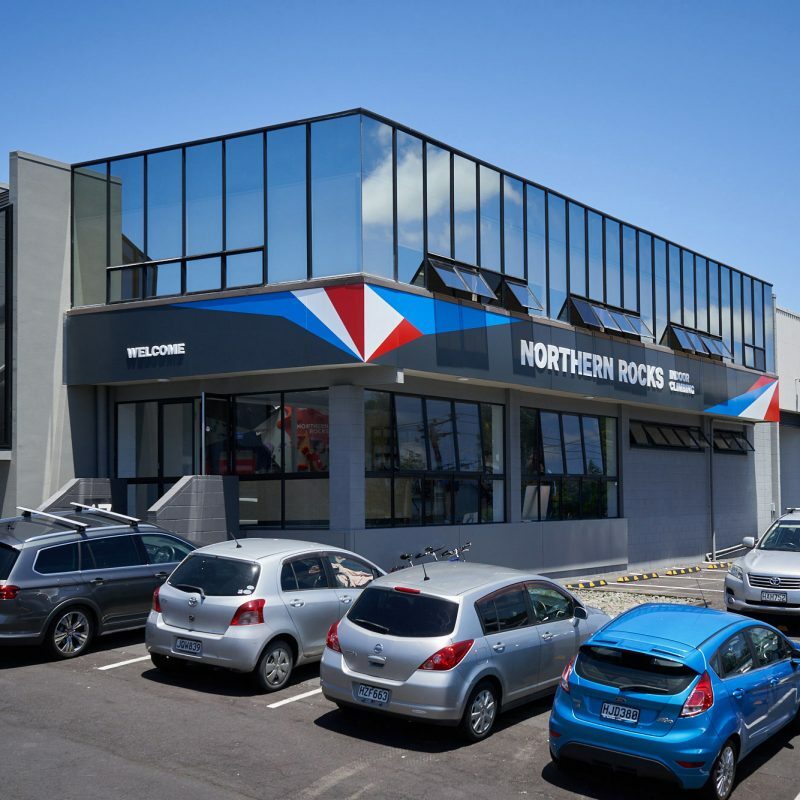 Viewing mezzanine overlooking the main floor, ideal space for catching up on work or social media with a multitude of charging stations and USB ports. 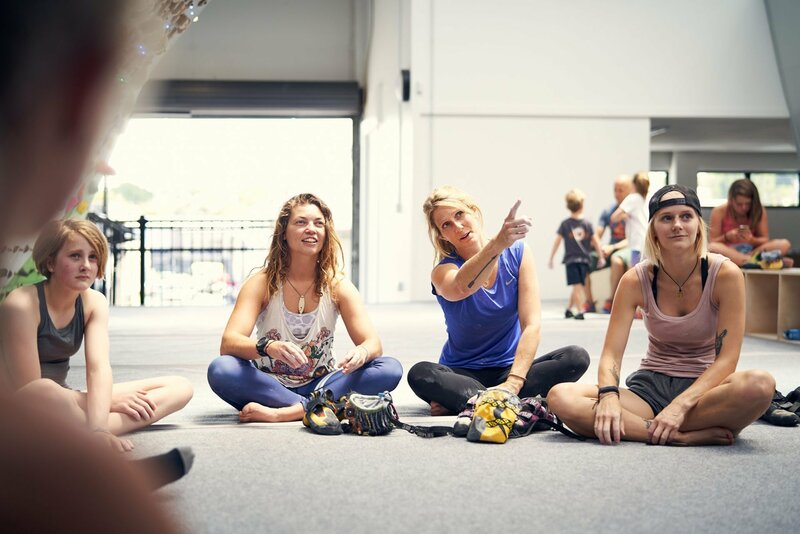 The benefits of yoga are recognised far and wide. 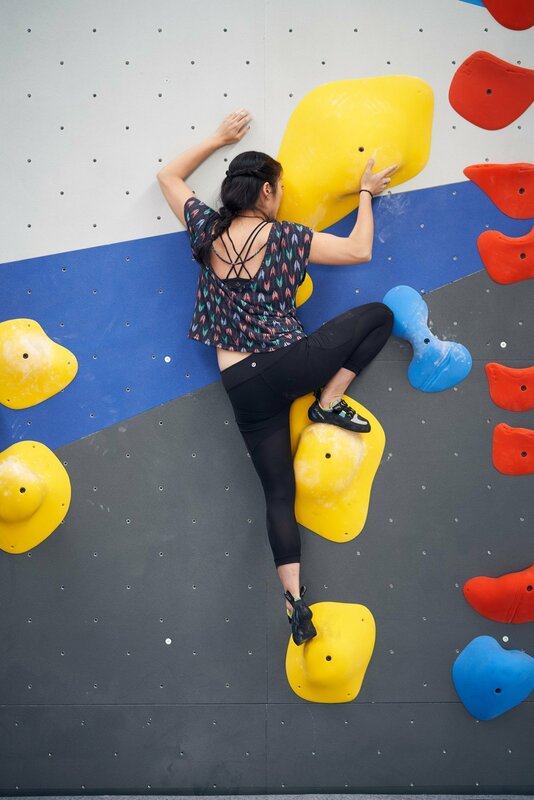 Climbing specific yoga, stability and strength, relax and stretch. 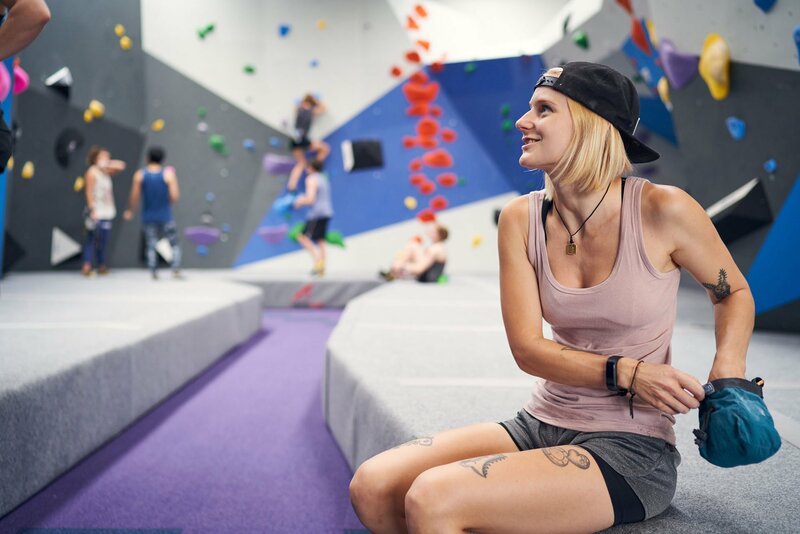 Barista made coffee Free WIFI for members. 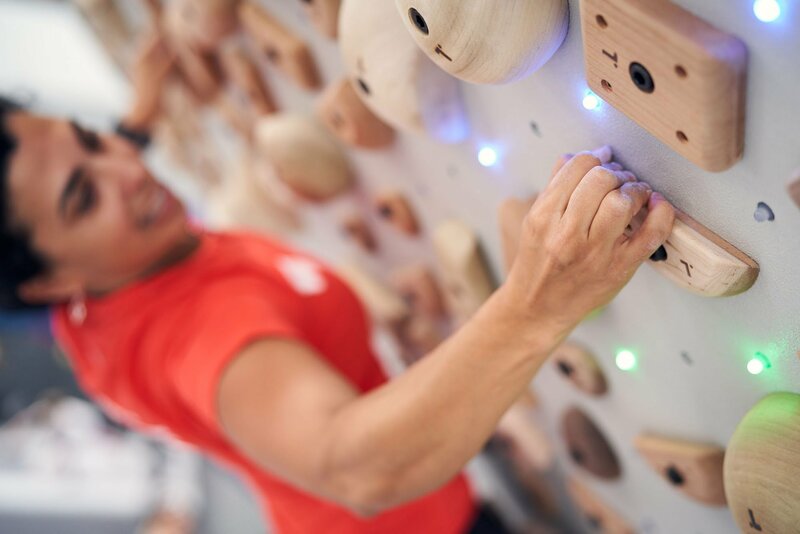 Our Tension board is the ultimate combination of great wooden holds, a user friendly app, and an LED system to illuminate a selected problem. 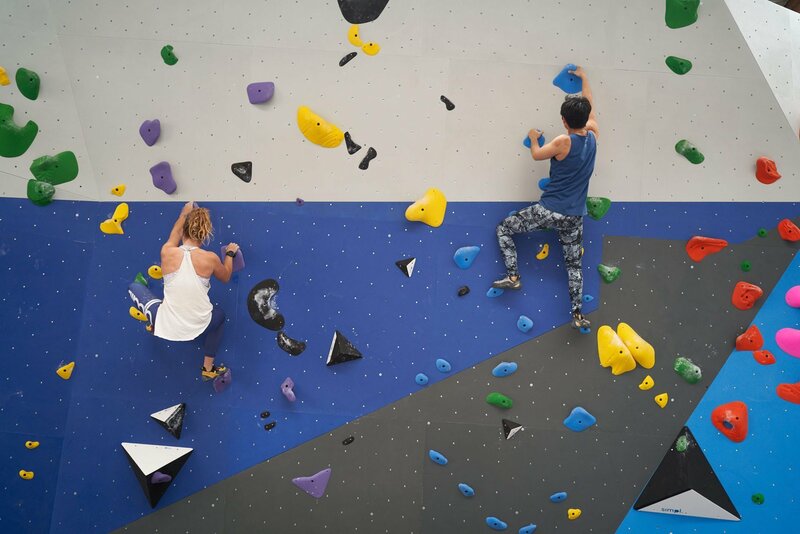 The board is 8×12 wall size with symmetrical set holds to promote balanced training. 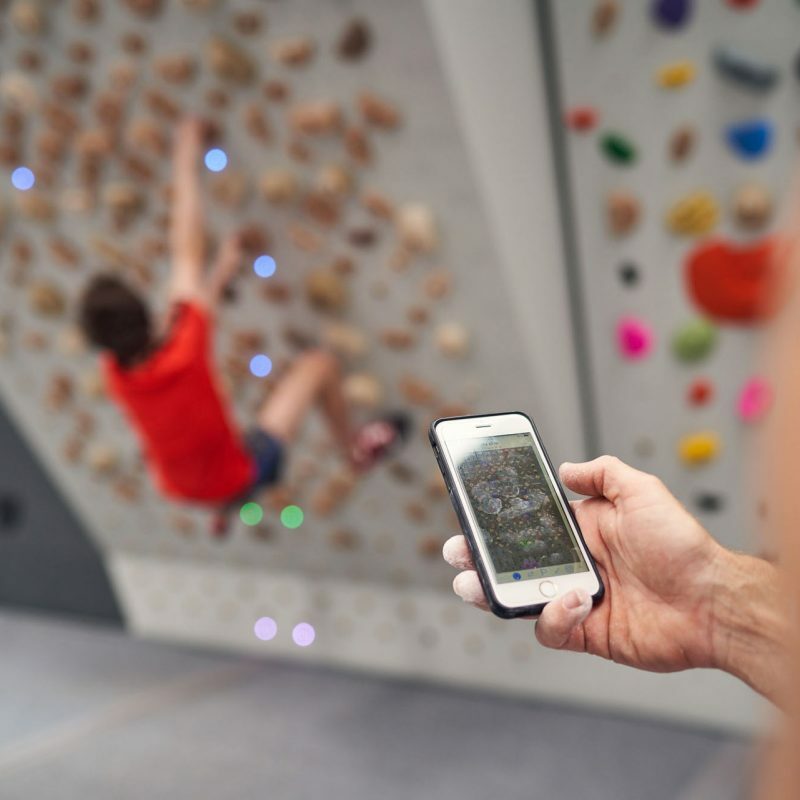 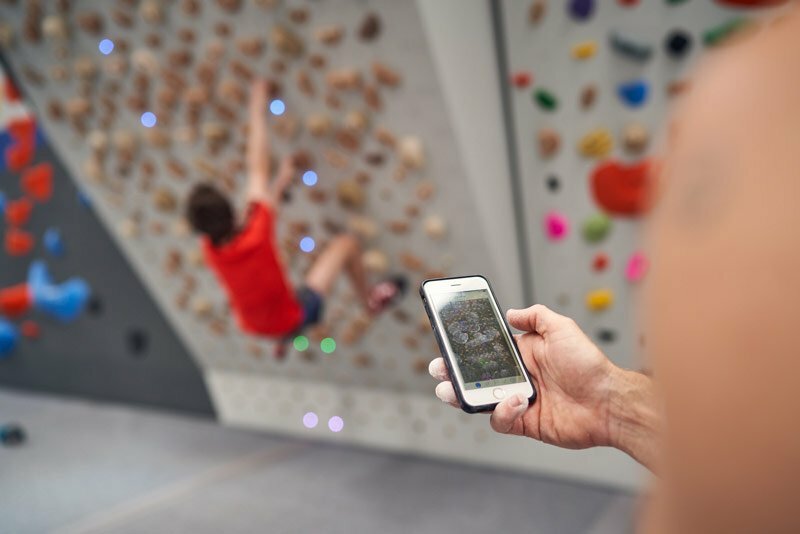 Boulders are stored on the APP so you can climb a boulder set by someone across the world! 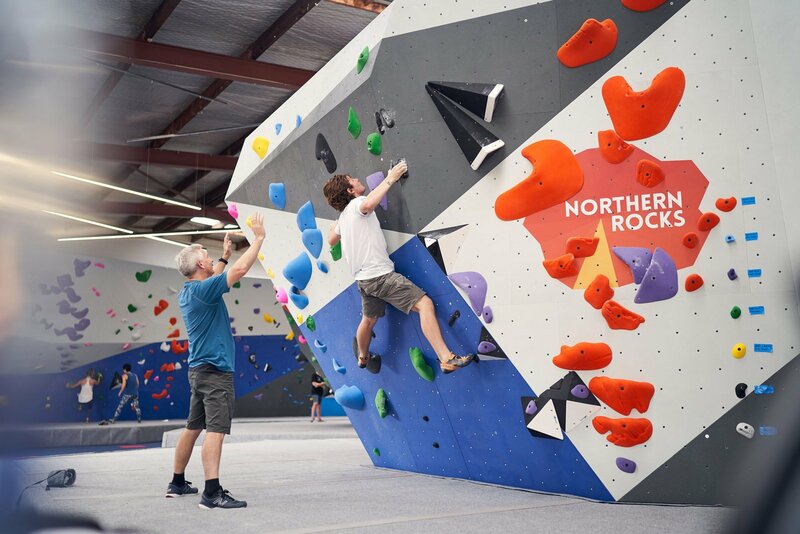 Create your own boulder, or click to climb an established problem. 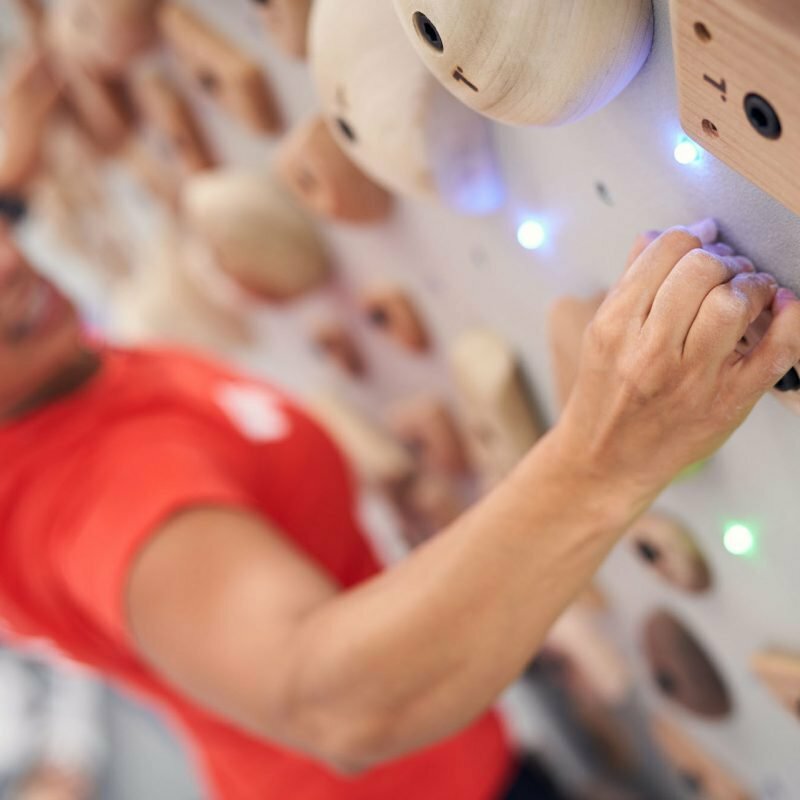 Your holds will light up with LED lights so you can easily see the specified holds. 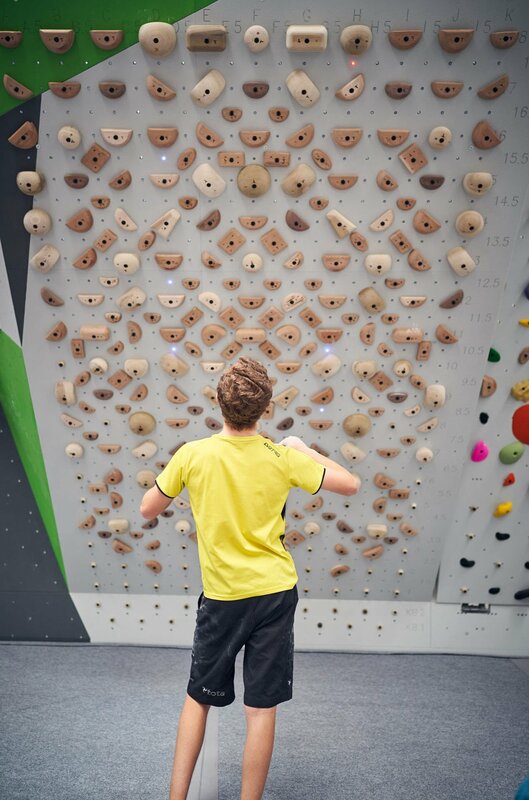 The board is symmetrical so you can create a boulder for left side movements, hit the mirror button on the app and illuminate the same boulder on the right side. 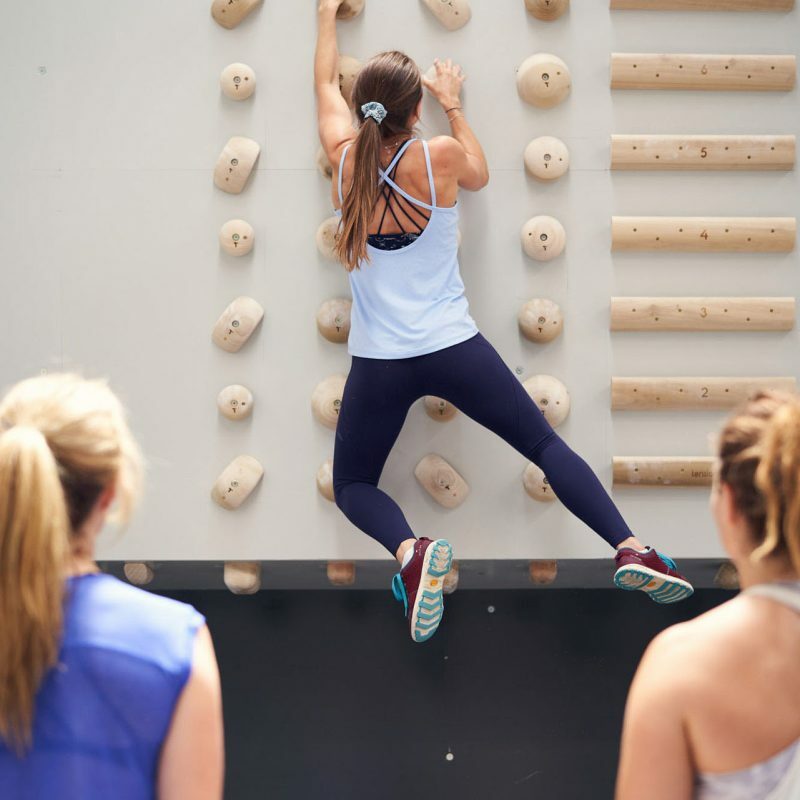 Excellent for equally practicing moves on both sides of the body! 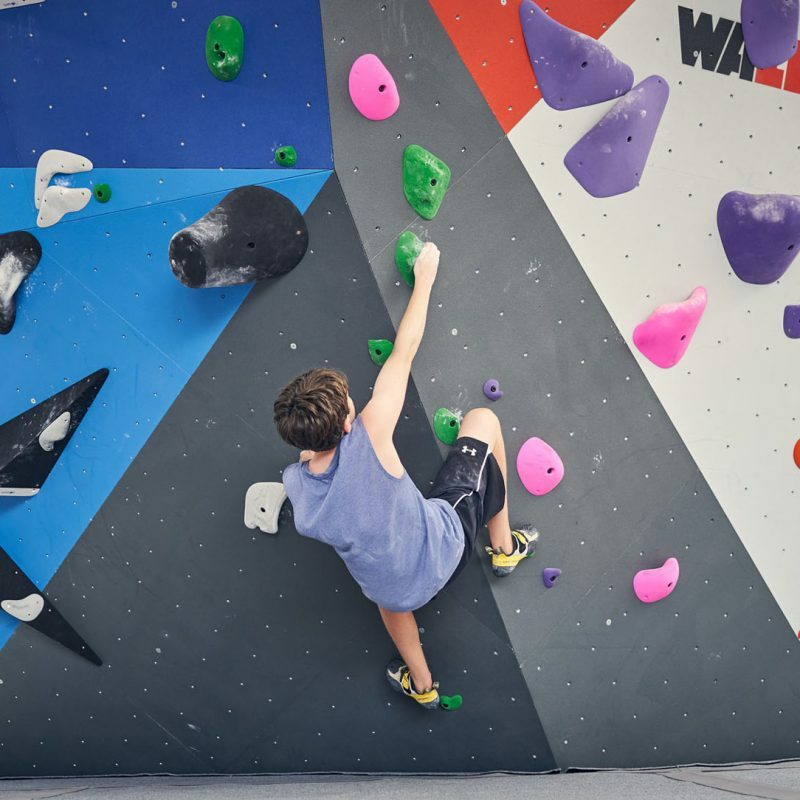 Wood holds offers a less abrasive option for those looking to maximize their training while keeping skin in top condition. 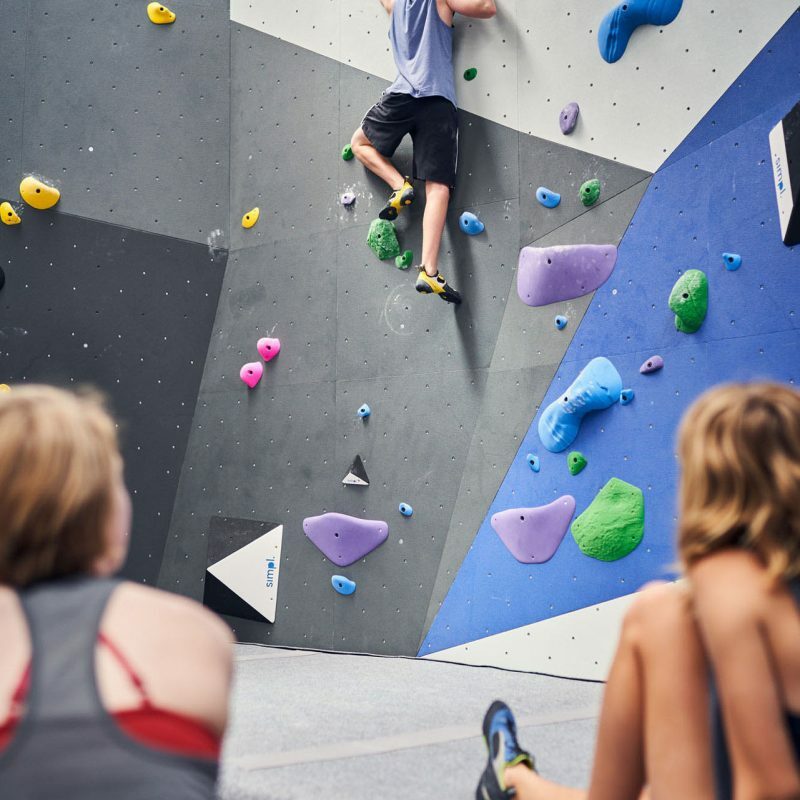 A campus board is a training tool that has been widely adopted to improve rock climbing performance. 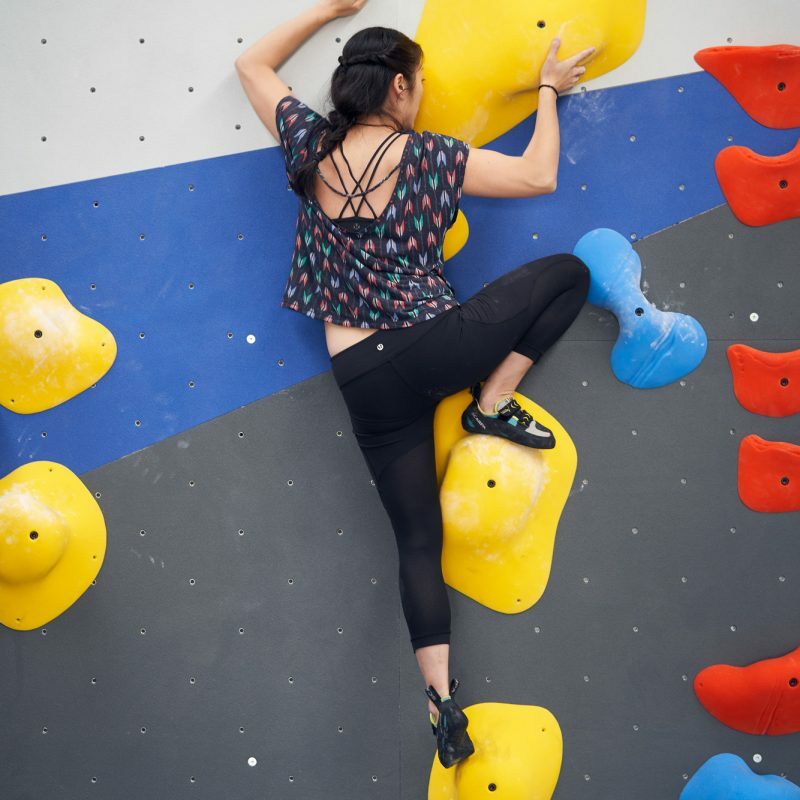 Typically, a user ascends or descends the campus board using only their hands. 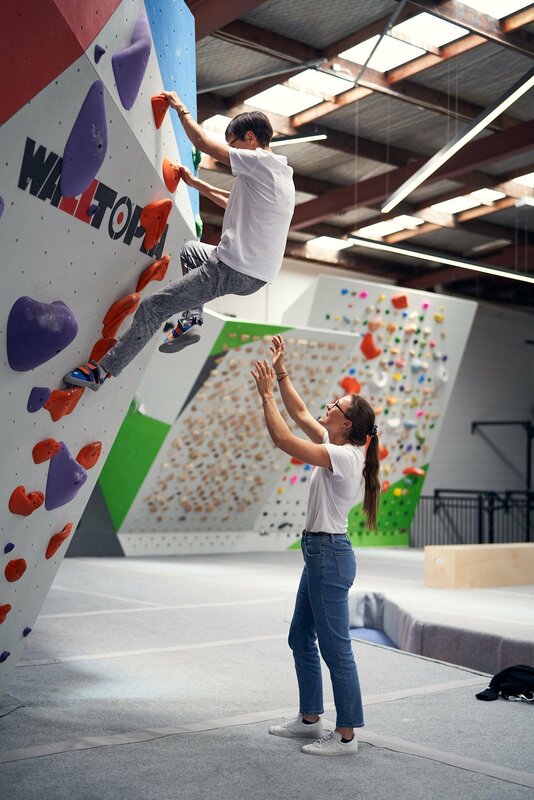 Our campus board is set at a slight overhanging angle of inclination and includes some foot holds on the base board for safe and beginner level campus training. 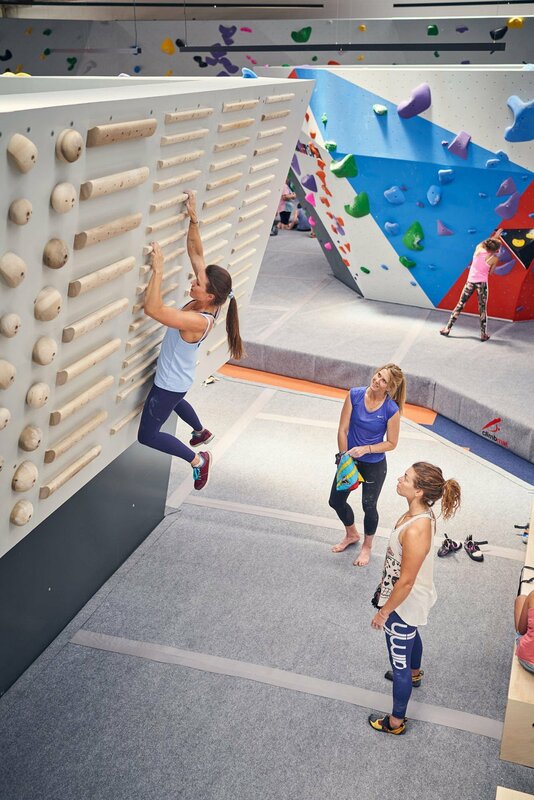 Our campus board features the classic Tension wooden campus rungs and other holds for footless climbing, including slopers and pinches in a grid formation. 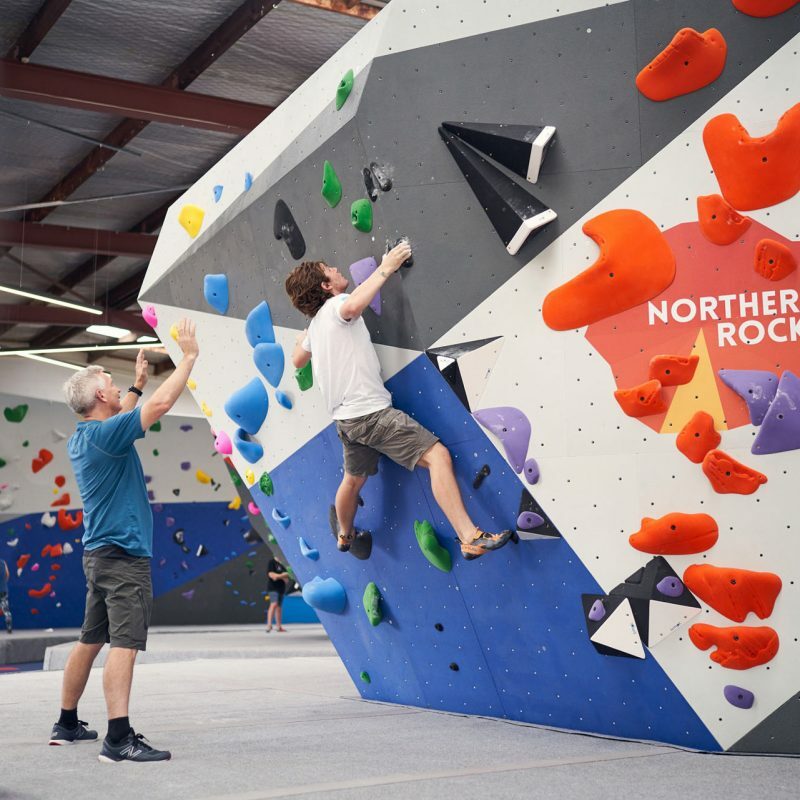 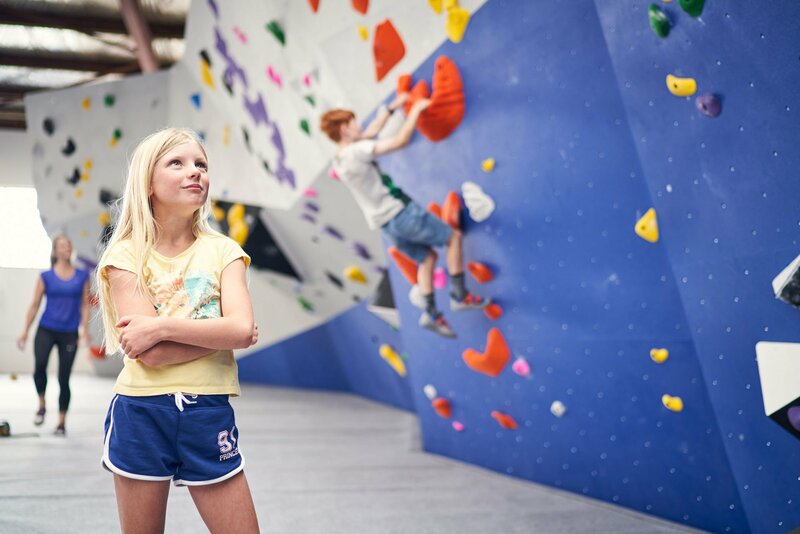 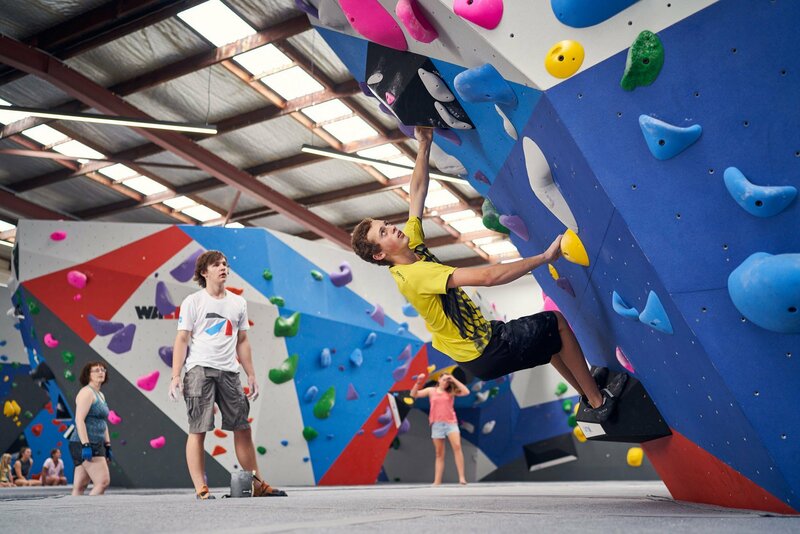 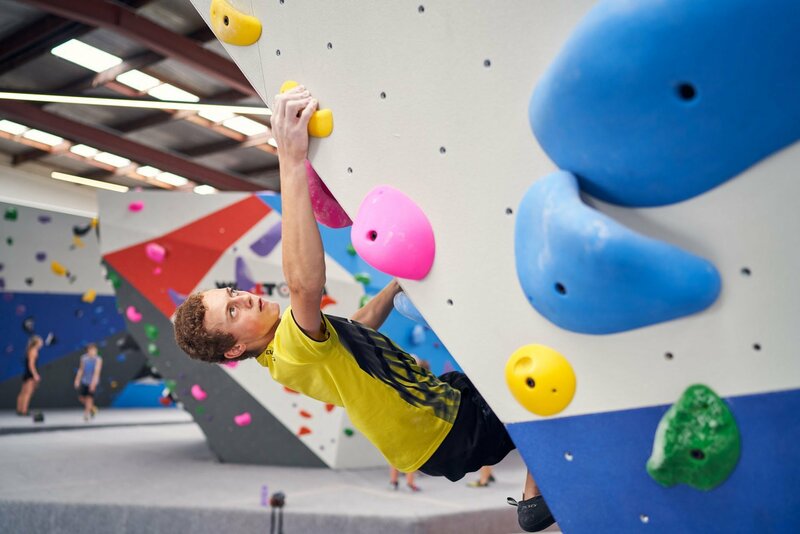 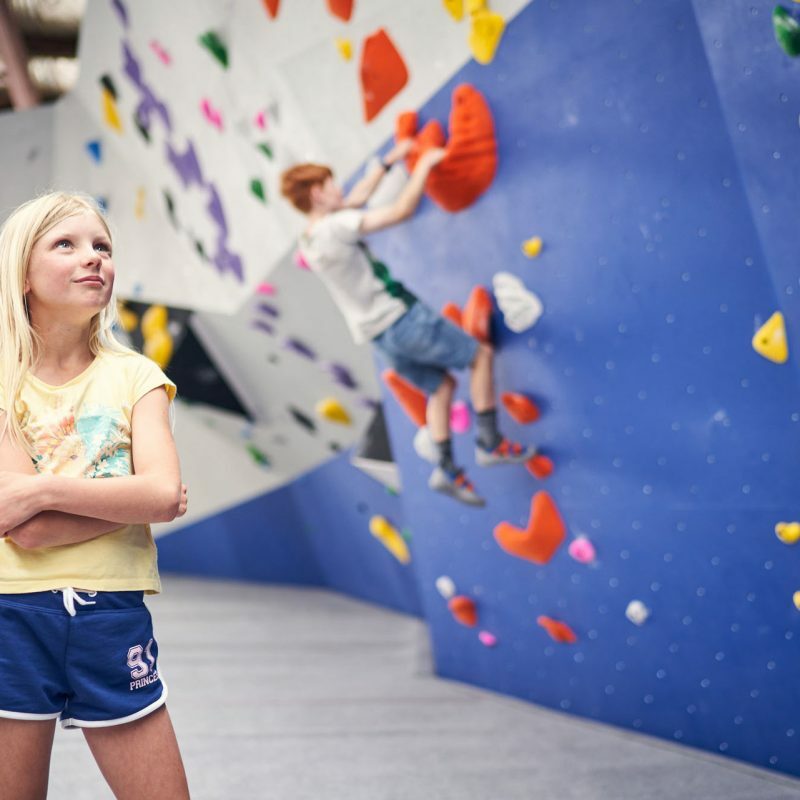 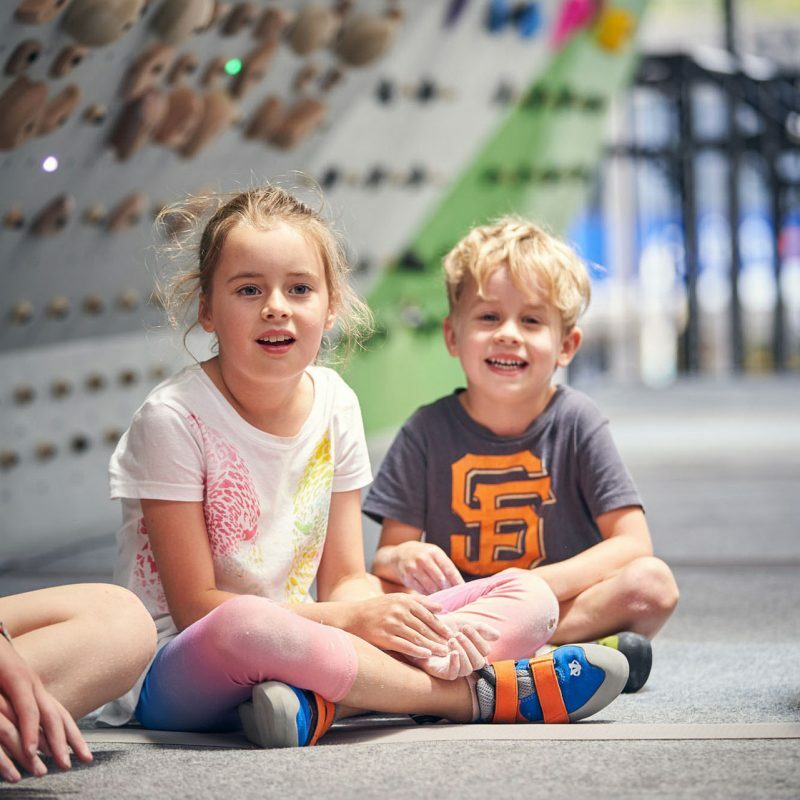 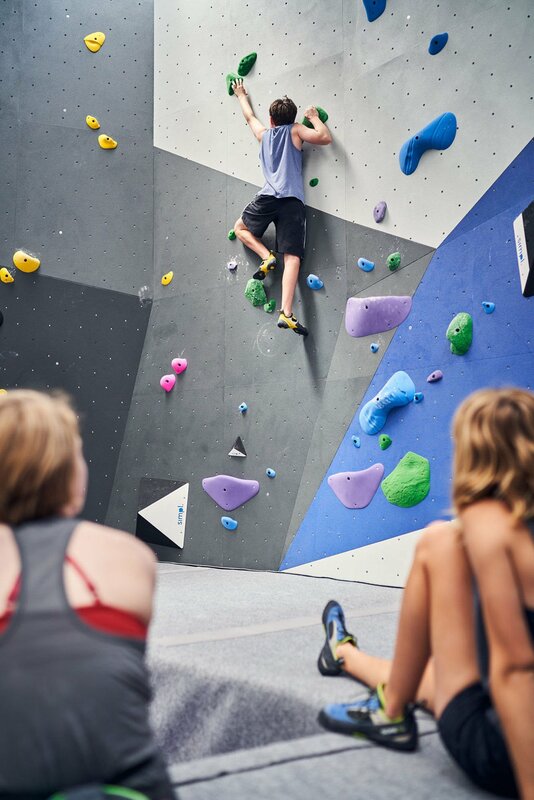 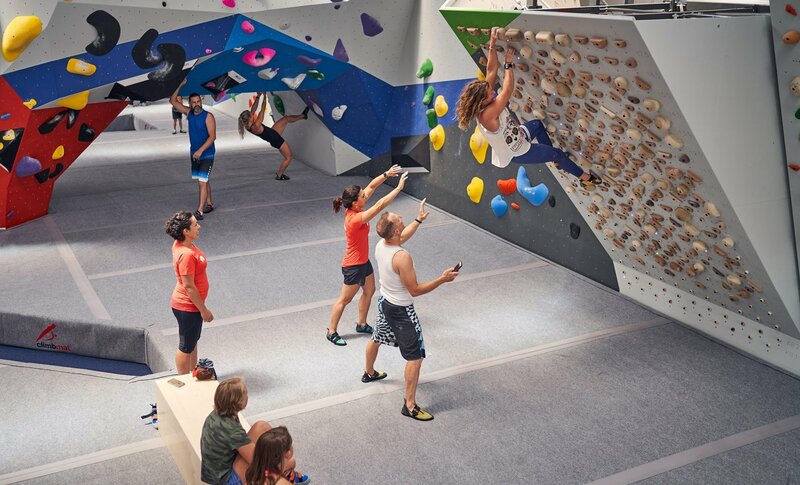 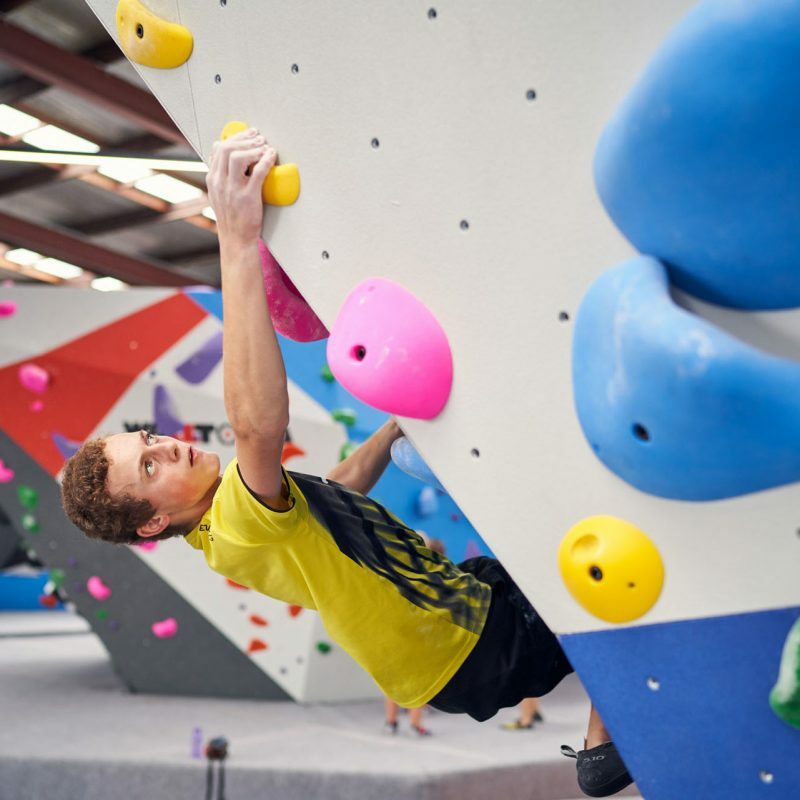 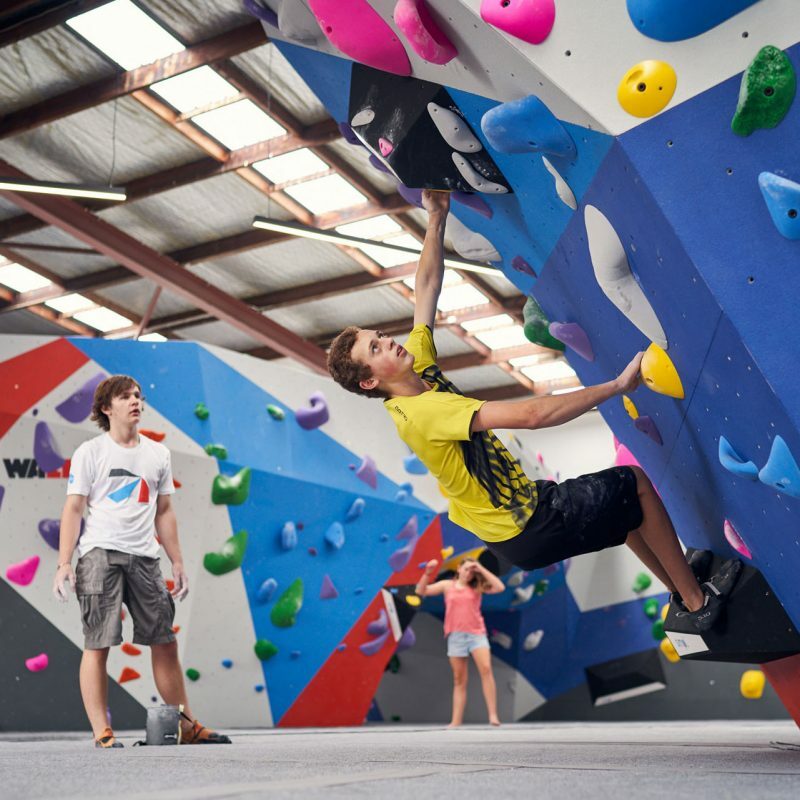 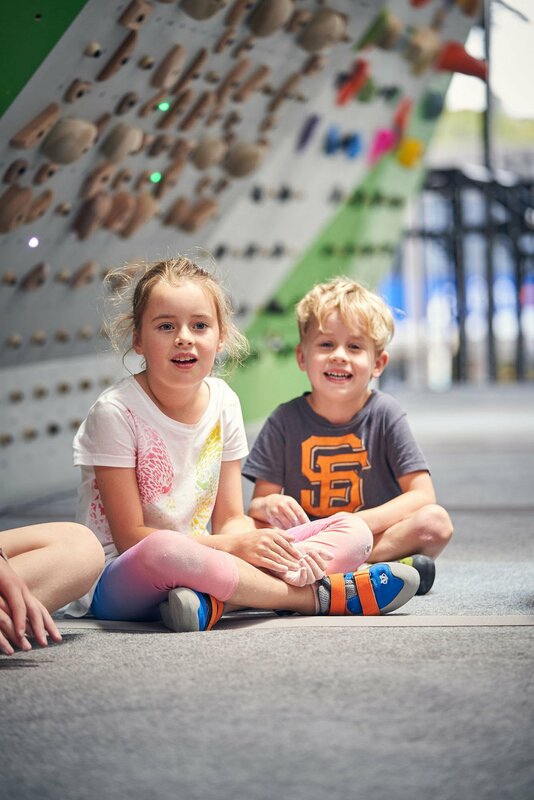 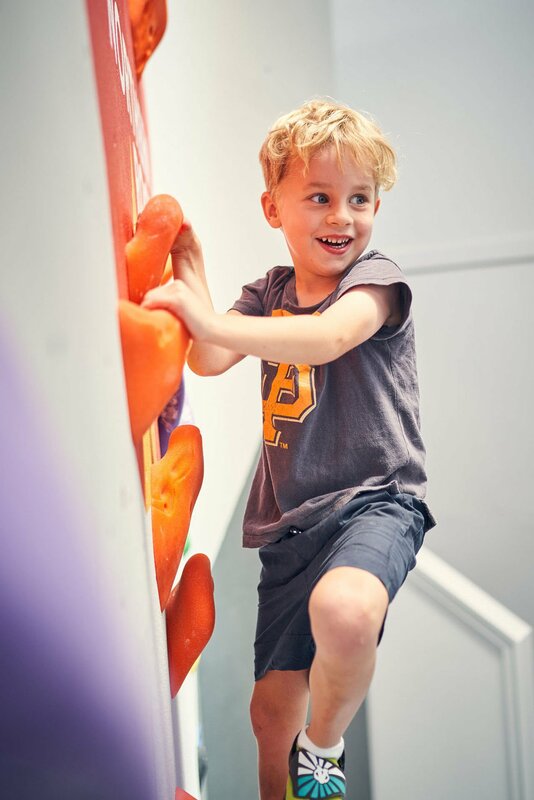 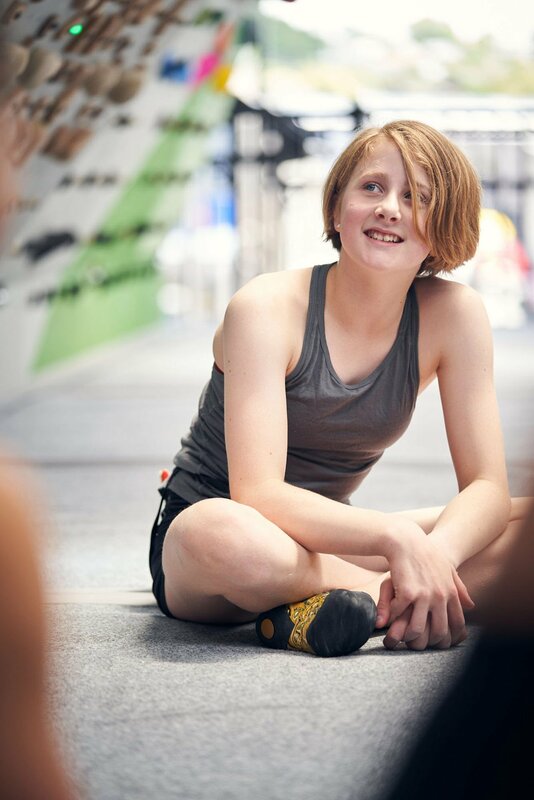 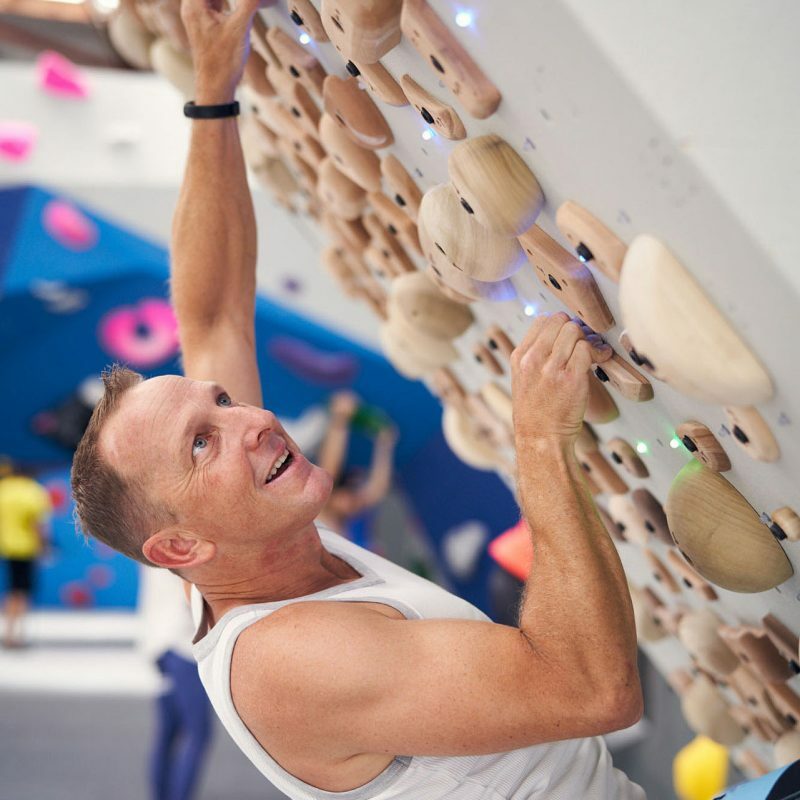 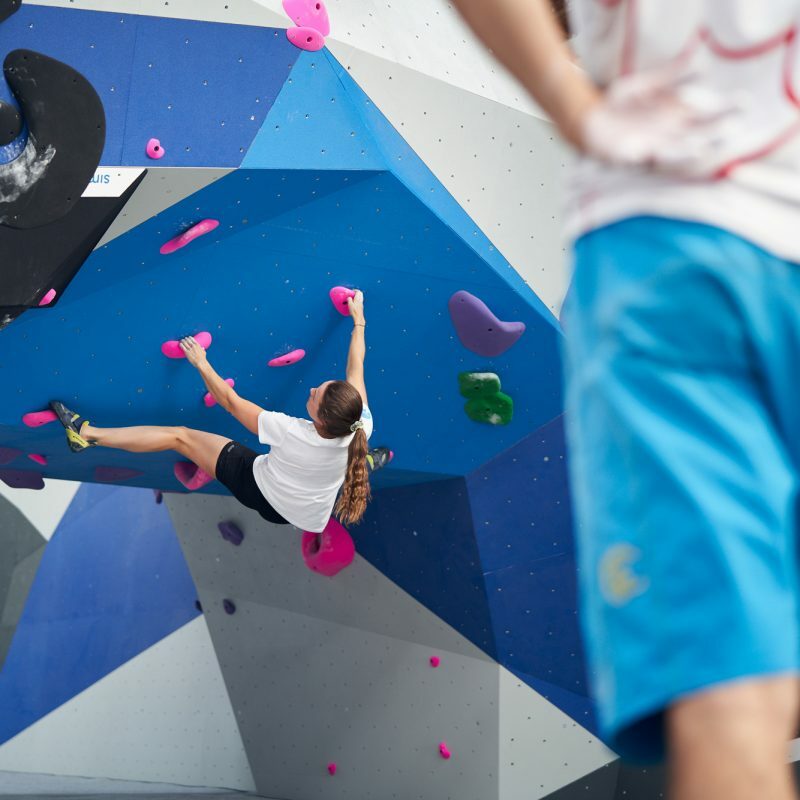 Practice your dynamic climbing, build hand strength, challenge your friends and get strong! 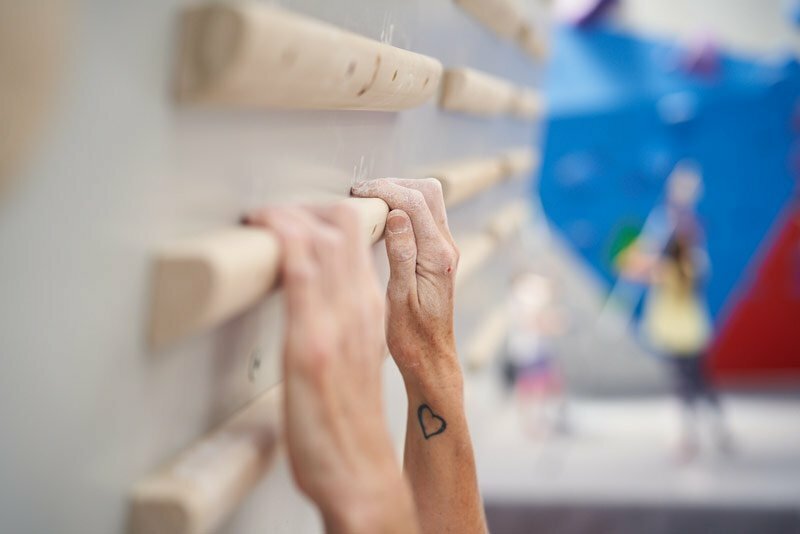 Don’t know what a sloper or pinch is? 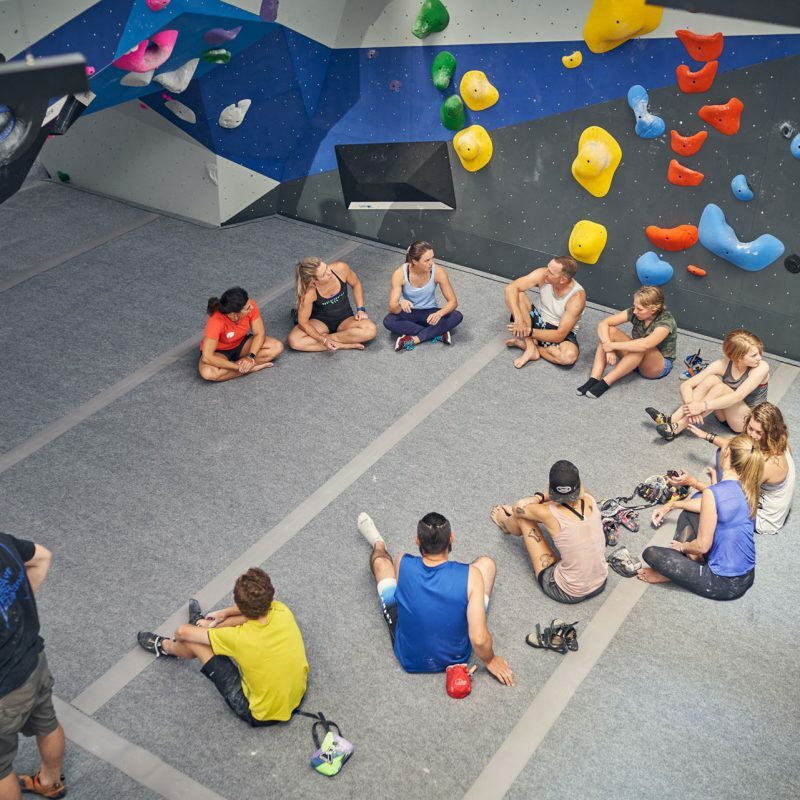 Check out one of our classes! 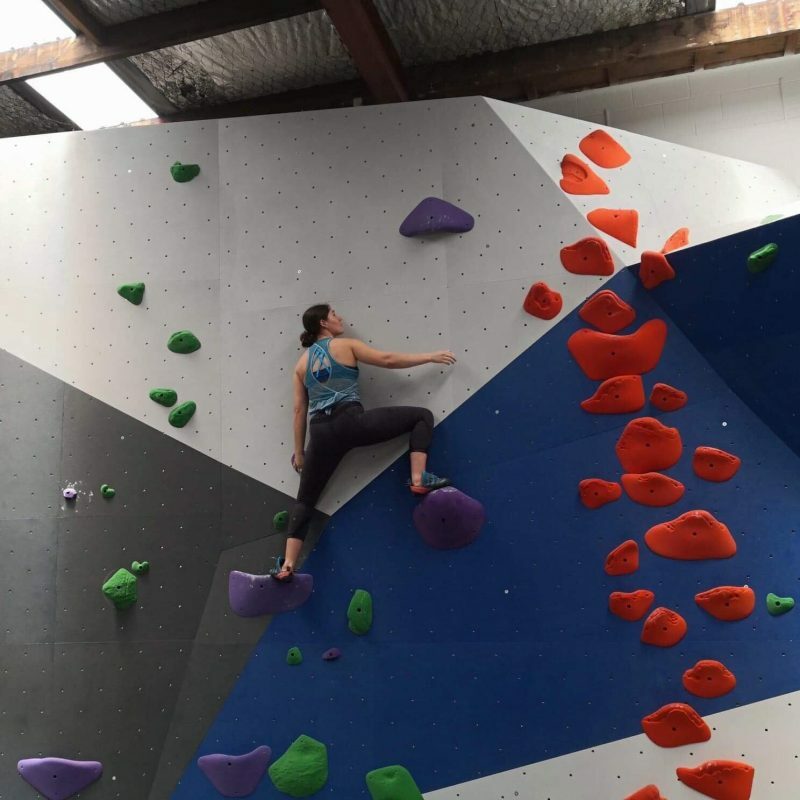 Love making up your own boulders? 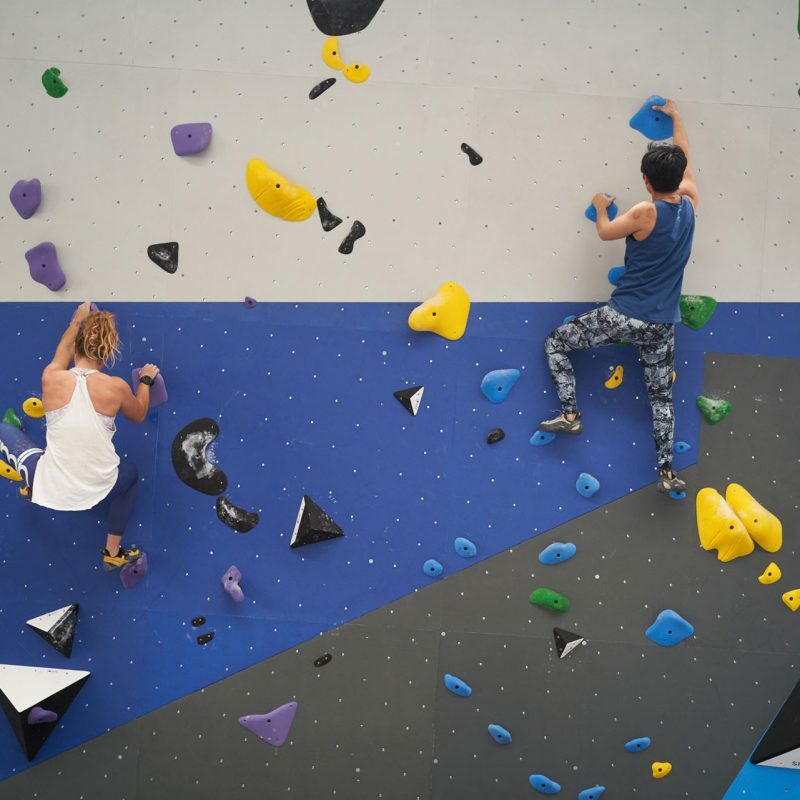 Want to build endurance with boulder circuits? 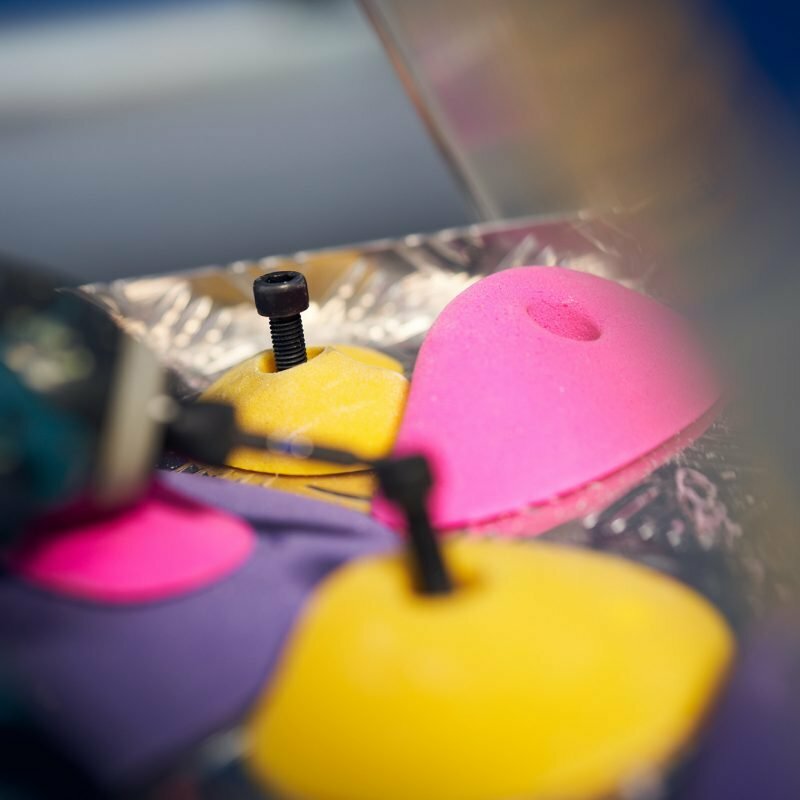 The hydraulic board is your answer. 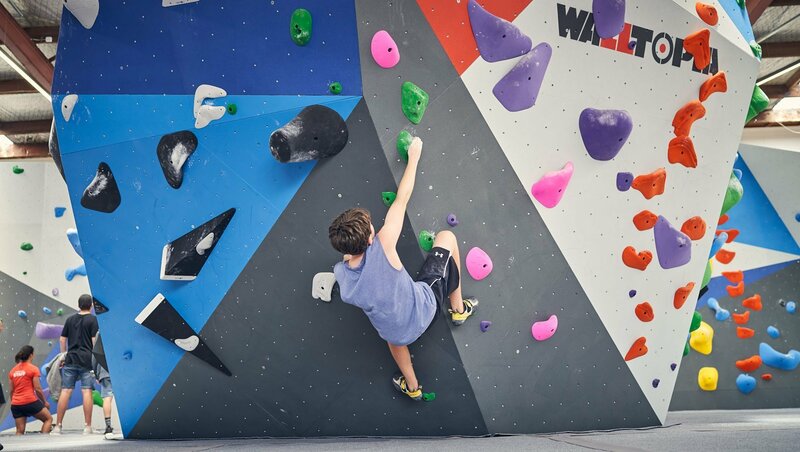 This board is fully adjustable with hydraulic arms that can change the angle of the wall from vertical to 50 degrees overhang. 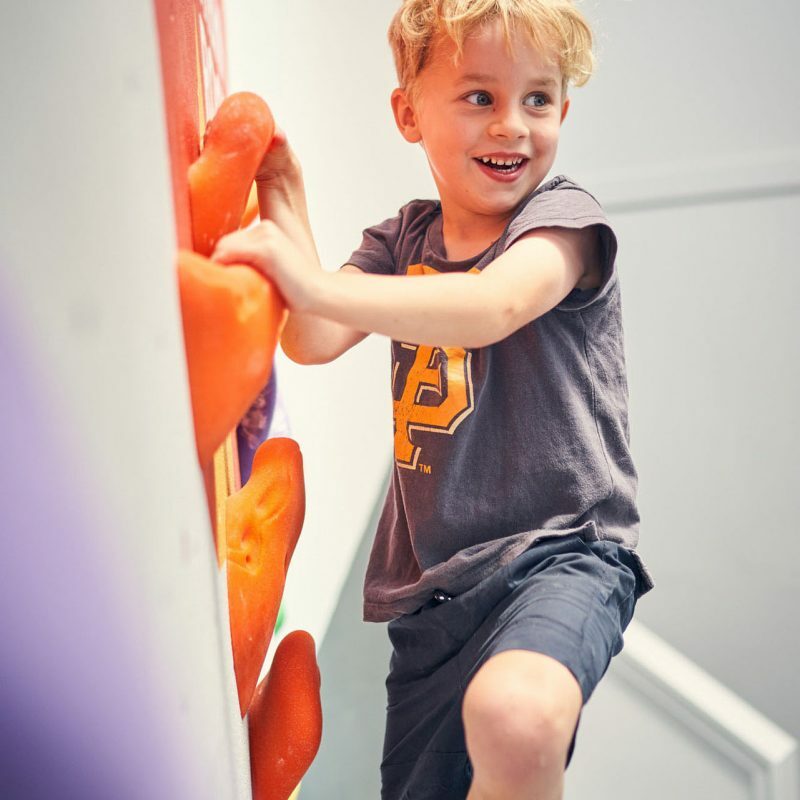 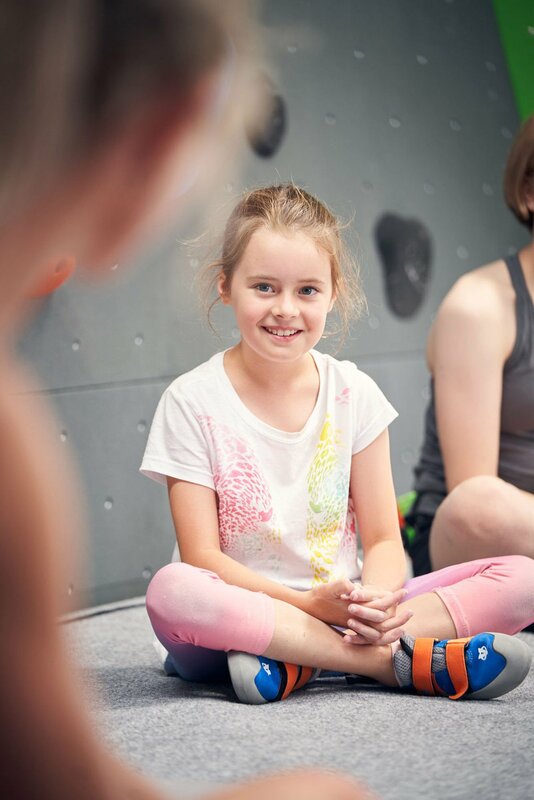 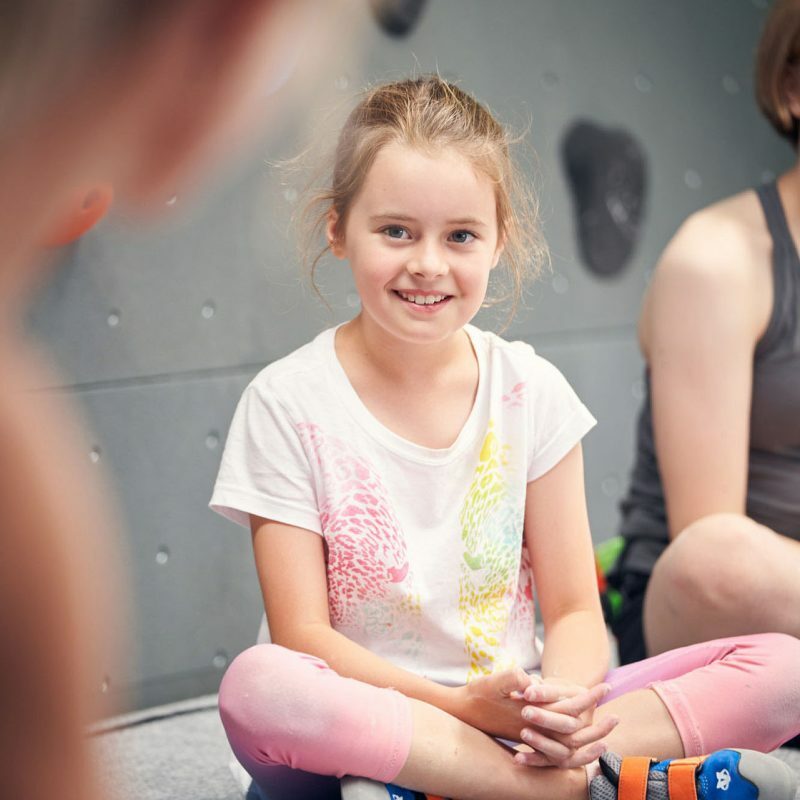 Challenge yourself by creating your own boulder or circuit and increasing the angle each time you climb it! 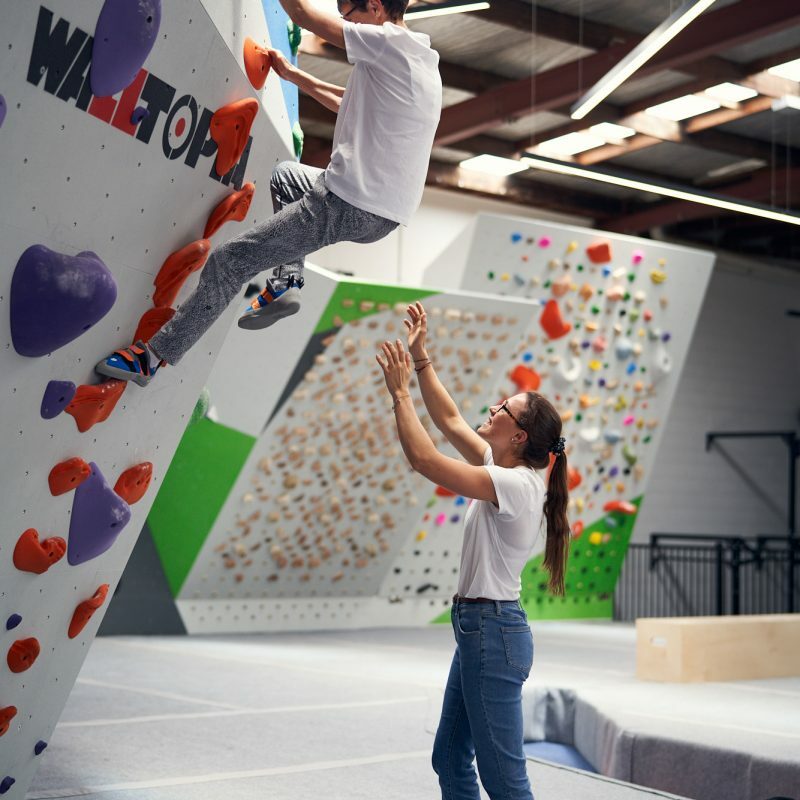 The board features finger friendly wooden holds from Tension, a range of shapes from Kilter, the iconic Pusher holds and the first ever climbing holds in NZ shaped by Kiwi Mark Jones. 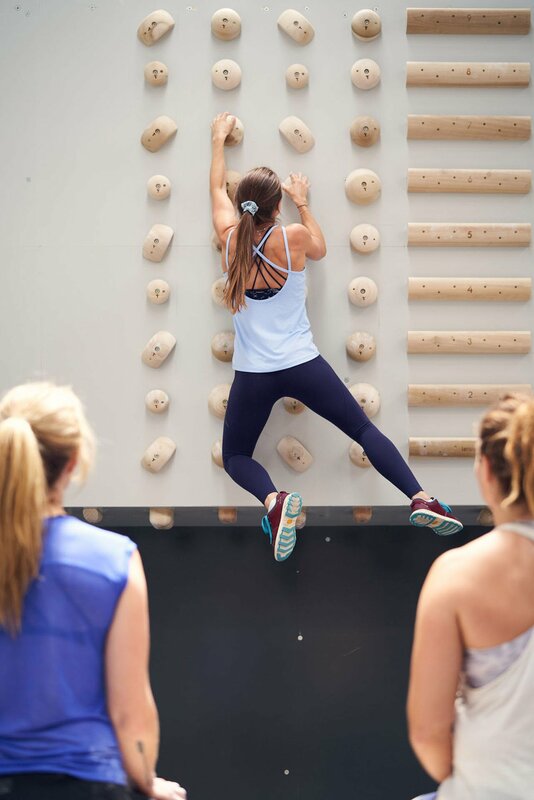 Increase your full body strength, fitness and flexibility, core tension and hand strength with our dedicated calisthenics training area. 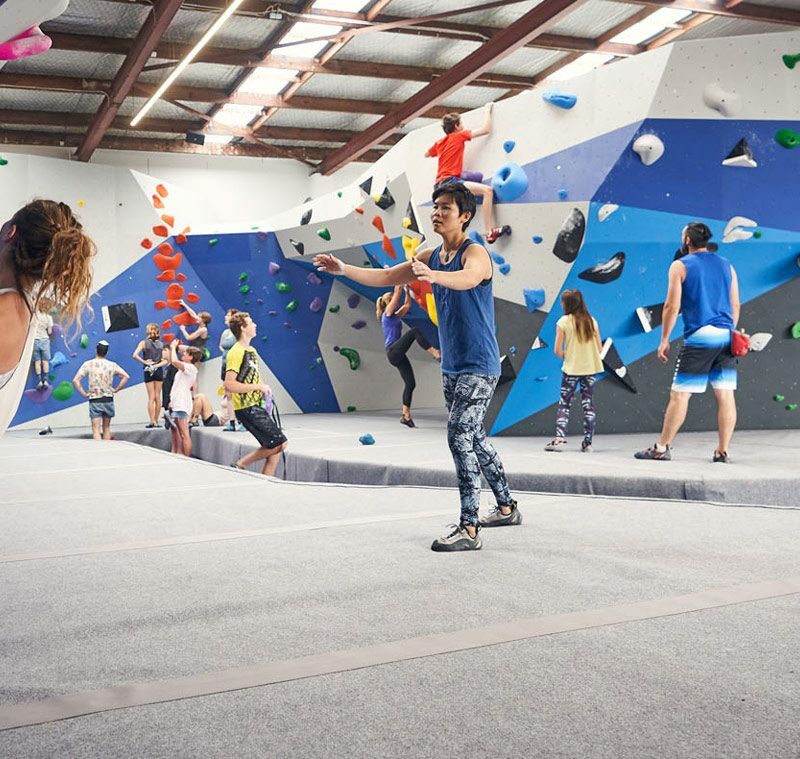 We have pull up bars, a dip station, gymnastic rings, hang boards, hand weights and specialised flooring. 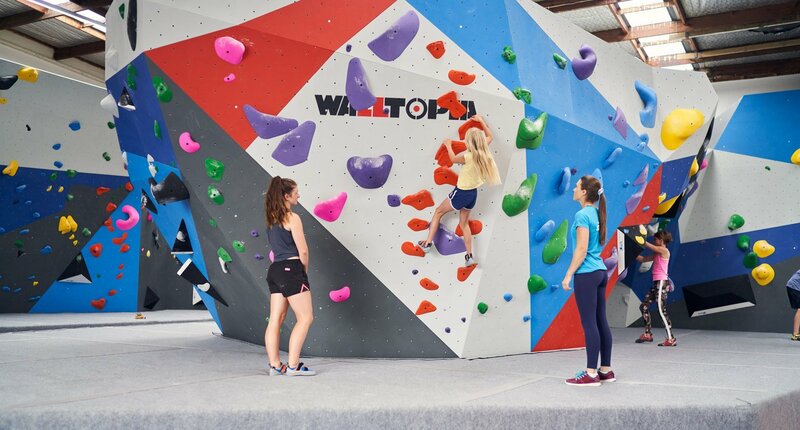 It’s a playground of strength and conditioning equipment for the well-rounded climber. 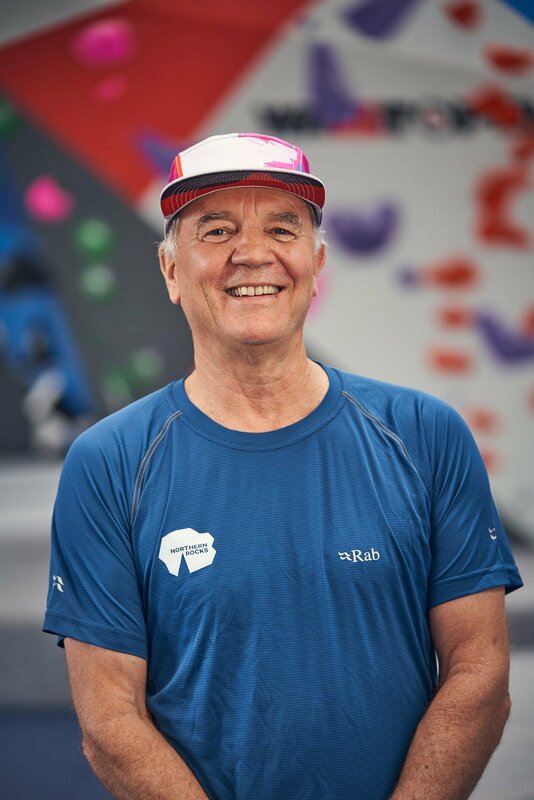 John Glaister. 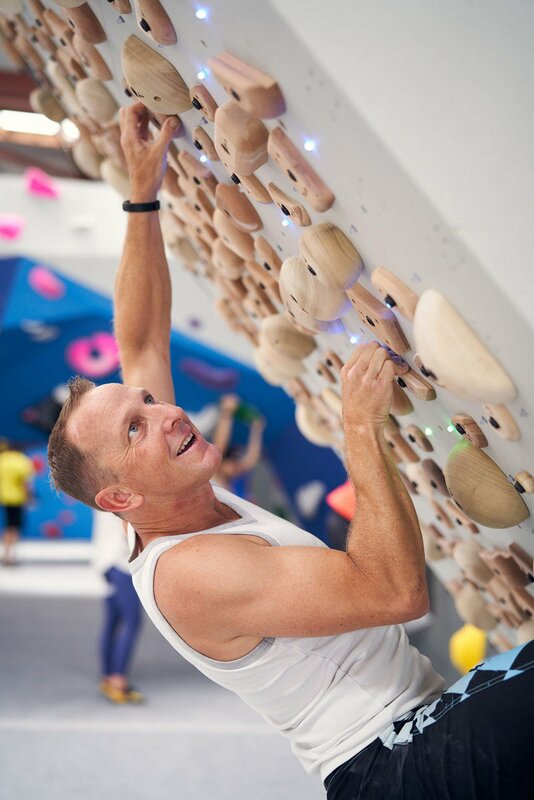 Tea Maestro.Partner in NR John Glaister shows us how to really enjoy bouldering! 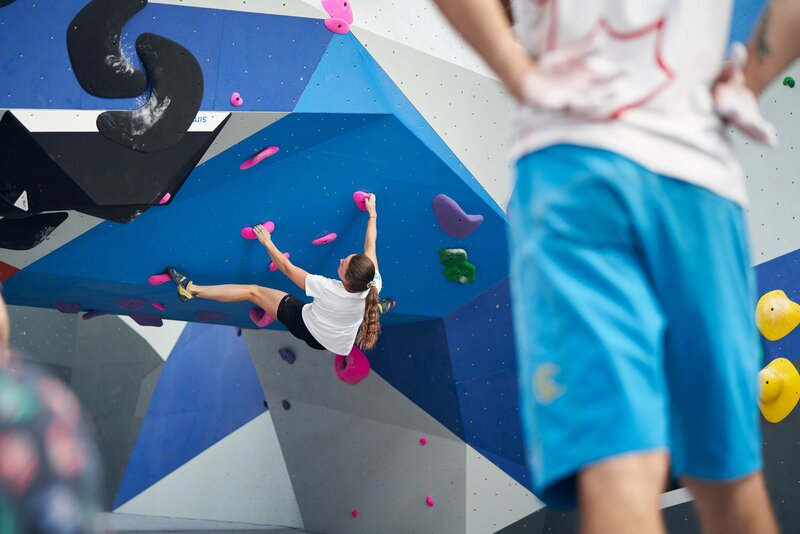 Route Setting with Sarah HaySilliness and fun times during the opening set at NR! 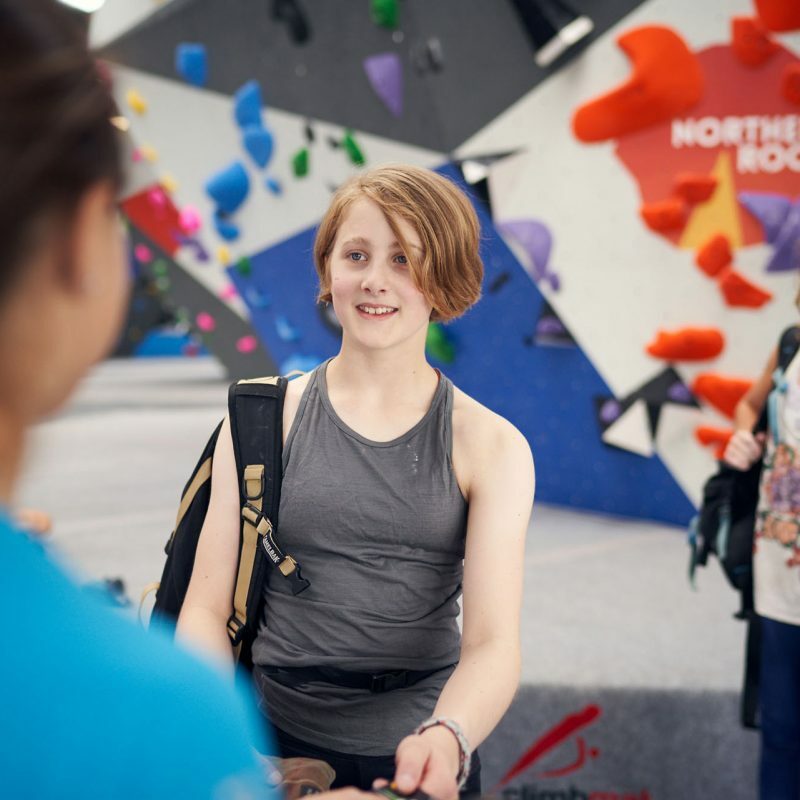 Meet Mae Mackenzie!Route setting fun times! 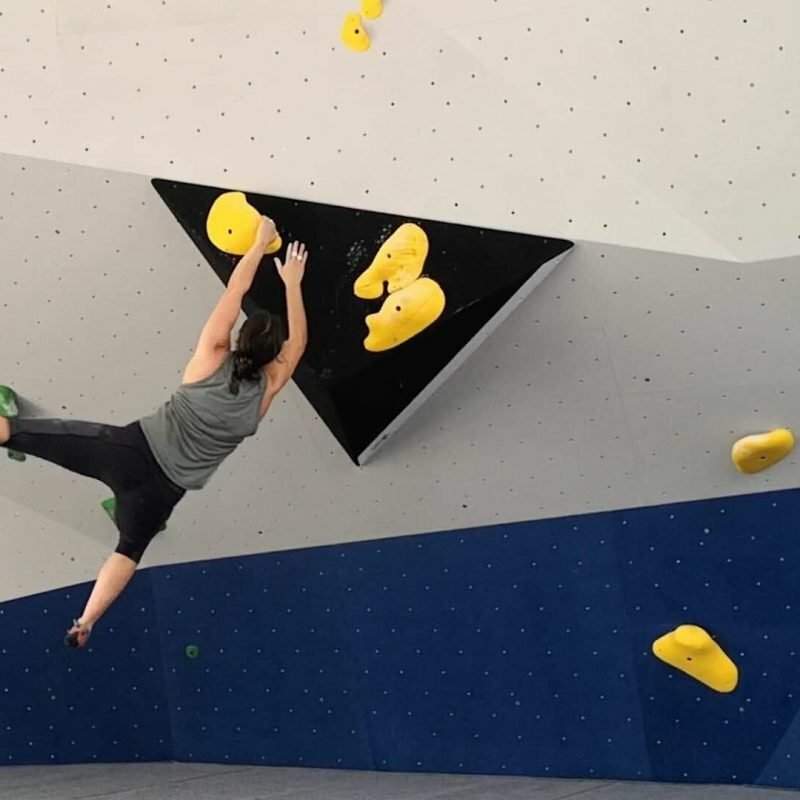 Mae on the Paddle Boulder!Route setting fun times!